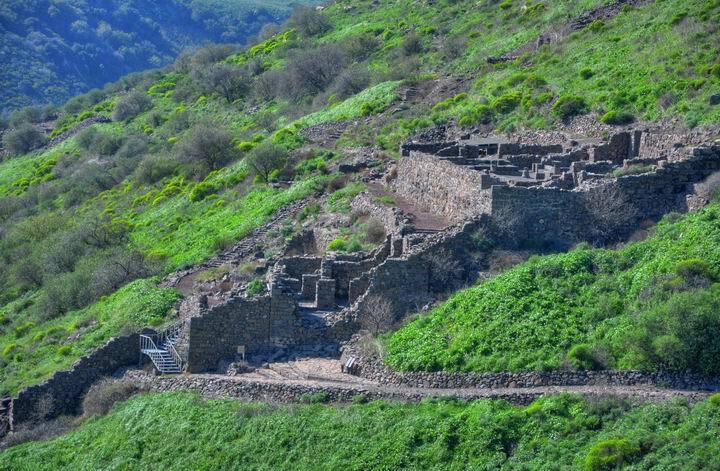 Gamla, a large fortified city located on a high ridge above a crossing of two gorges, is one of the famous cities where Jewish rebels fought bravely against the Romans until their fatal end. Its story of bravery is well detailed in Josephus Flavius historical accounts. The historian was actually the commander of the Galilee forces who also fortified the city. His story resembles the tragic accounts of Sepphoris and Masada, where the defenders fought the Roman legions until the tragic end. 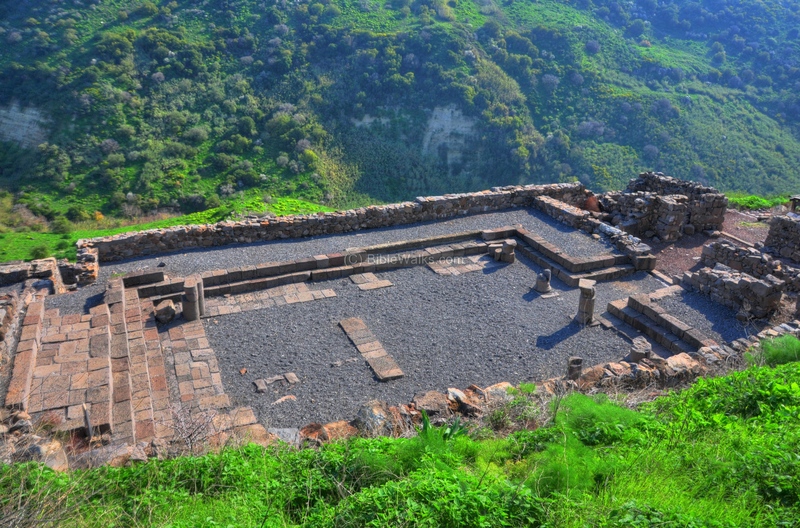 After its total ruin in 67AD, the location of Gamla was a mystery for 1900 years. 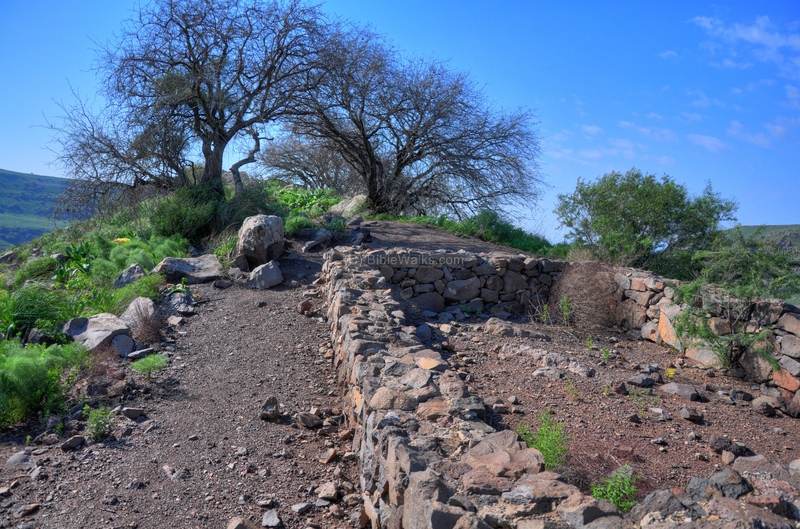 Since its discovery in a survey of the Golan (1968), subsequent archaeological excavations have reconstructed several parts of the city. 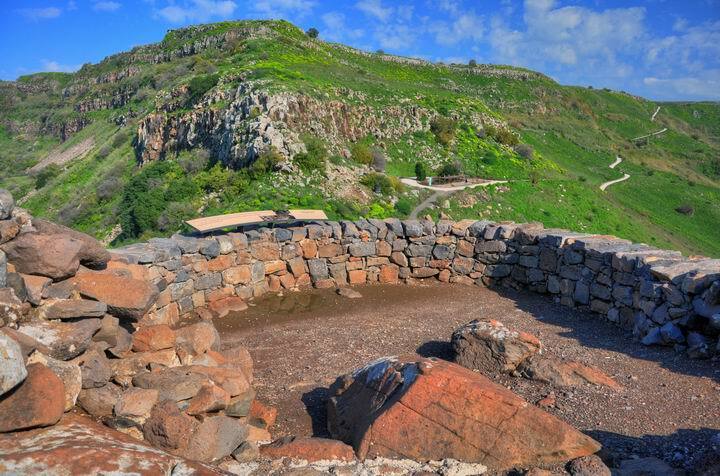 The findings closely match Josephus accurate accounts and shed light on one of the most tragic events in the history of the land. Gamla is located on a camel-shaped ridge, bounded by the deep gorges of Gamla and Daliyot streams. 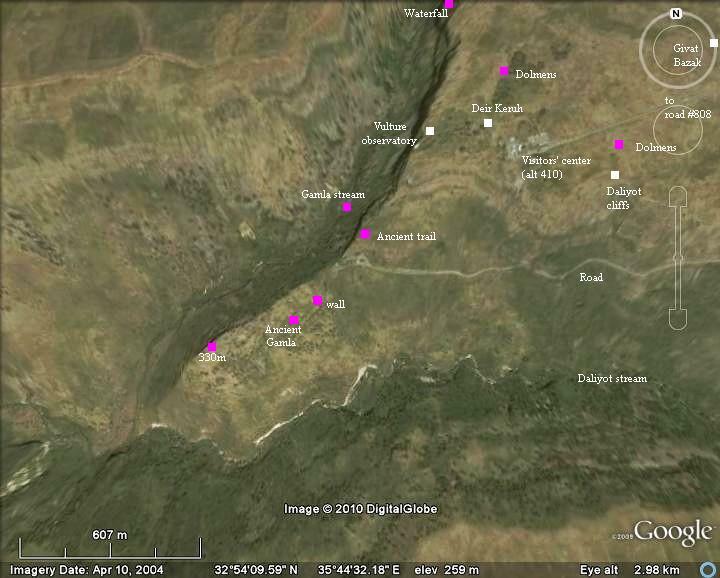 An aerial map of the area is shown here, indicating the major points of interest. The site is accessed from the visitors' center, then by trail down to the ruins. 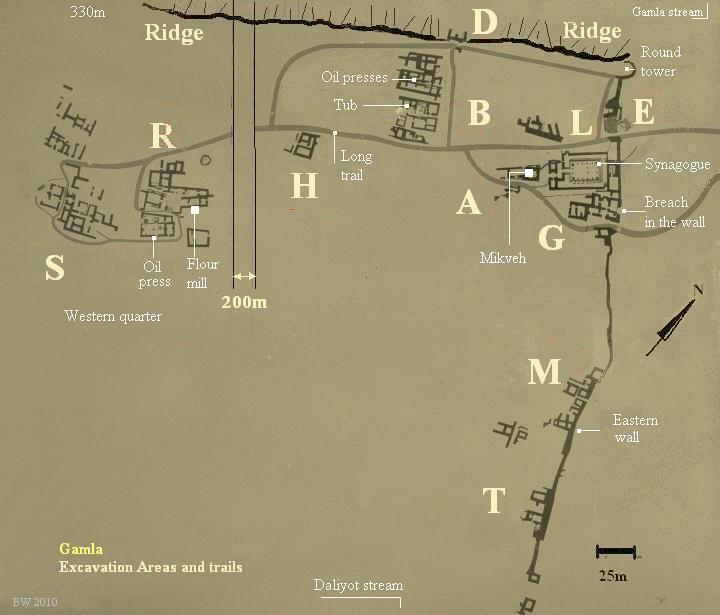 A Biblical map of the area near Gamla is illustrated below; Gamla appears on its right side. 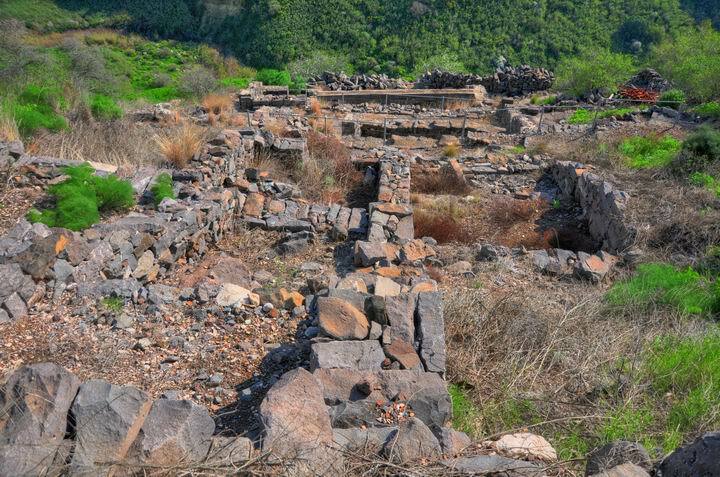 During the Bronze and Iron age, the area was called "Geshur" and was not part of the Israelite Kingdom (Joshua 13 11-13: "Nevertheless the children of Israel expelled not the Geshurites, nor the Maachathites: but the Geshurites and the Maachathites dwell among the Israelites until this day"). 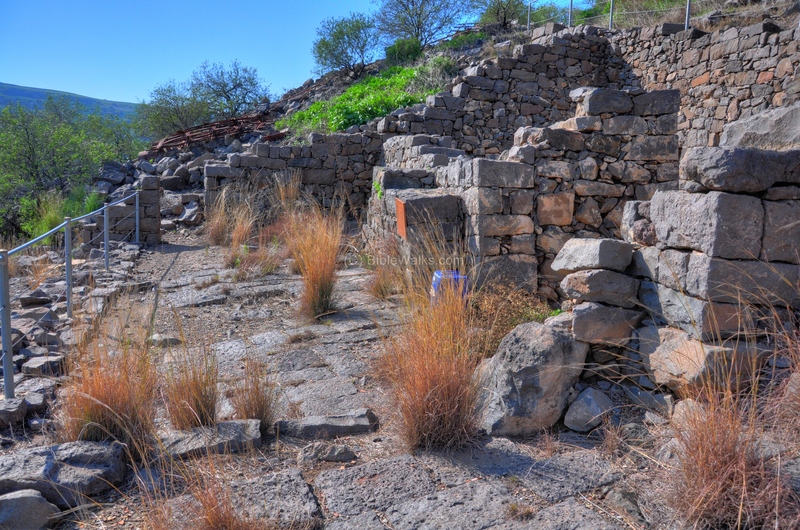 The land of Geshur was incorporated in the 9th C BC in the land of Aram, and controlled by its new capital city of Karnaim (Genesis 14 5: "Ashteroth Karnaim"), which means 'horns' (Amos 6 13: "Ye which rejoice in a thing of nought, which say, Have we not taken to us horns by our own strength?") . 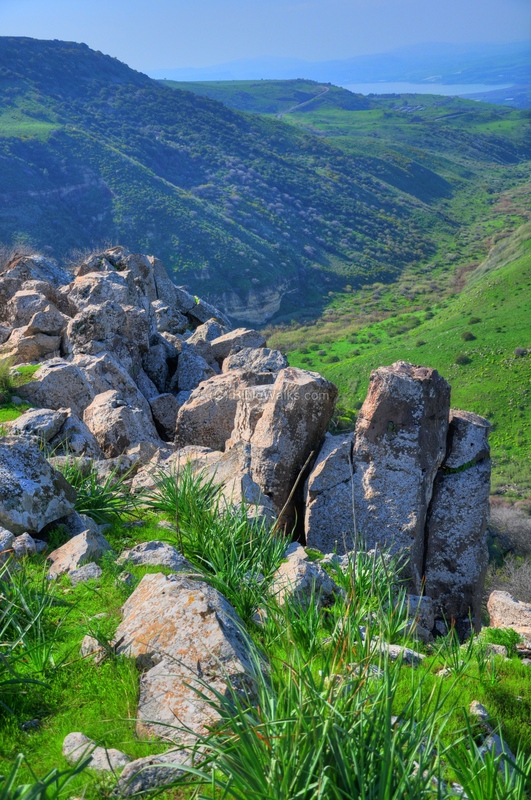 During the 8th and 7th C BC this was an Assyrian province of Karnaim. Remnants of a structure dated to the Early Bronze age (3,100BC - 2,500BC) were reconstructed in Area B. Other findings in Gamla provided evidence of the older period of settlement. The large number of Dolmens on the northern cliff, used by the prehistoric men as tombs, indicate a substantial period of settlement in that early period. 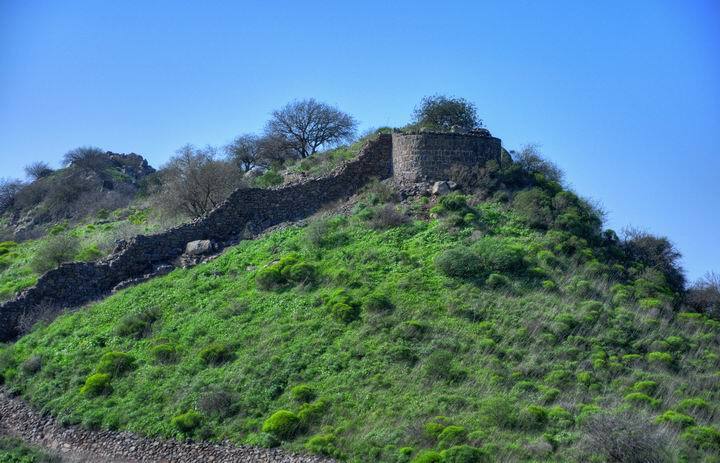 Although the Mishna lists Gamla as one of the walled cities during Joshua, no evidence was found to support this. 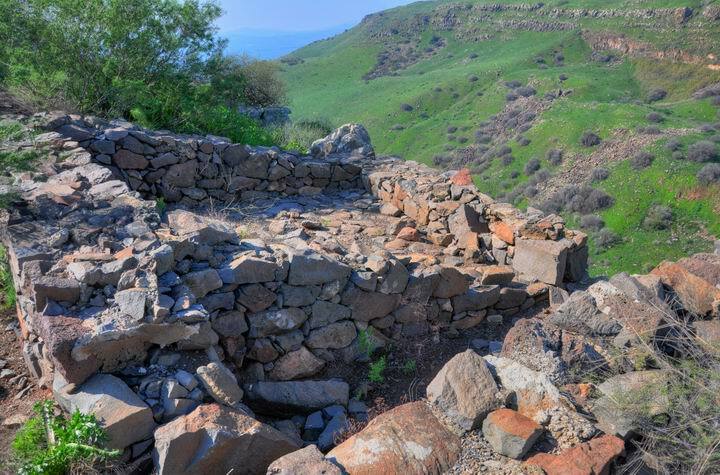 After 2,000 years, Gamla was inhabited during the Persian Period (5th-4th C BC), following the return of the Judean exiles back to Zion. During the Persian period and Hellenistic periods the city increased in size and was fortified. The Roman historian Josephus Flavius wrote that many years later (years 83-80BC), that Gamla came under Jewish control: During Alexander Janneus's campaign on the eastern territories, the Hasmonean king captured Gamla (Wars 1 4): "Alexander... took the strong fortress of Gamala". 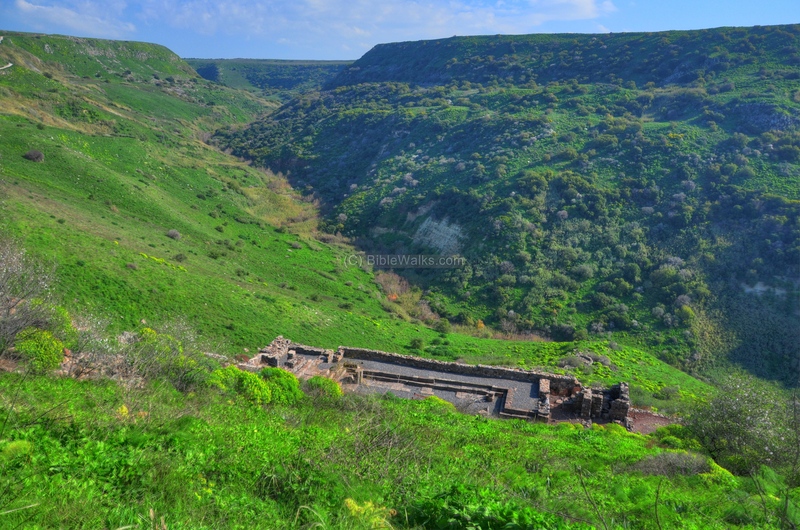 After 20 years, after the Romans annexed the land (63BC), General Pompey implemented political reformations, which removed Gamla from the Hasmonean state. 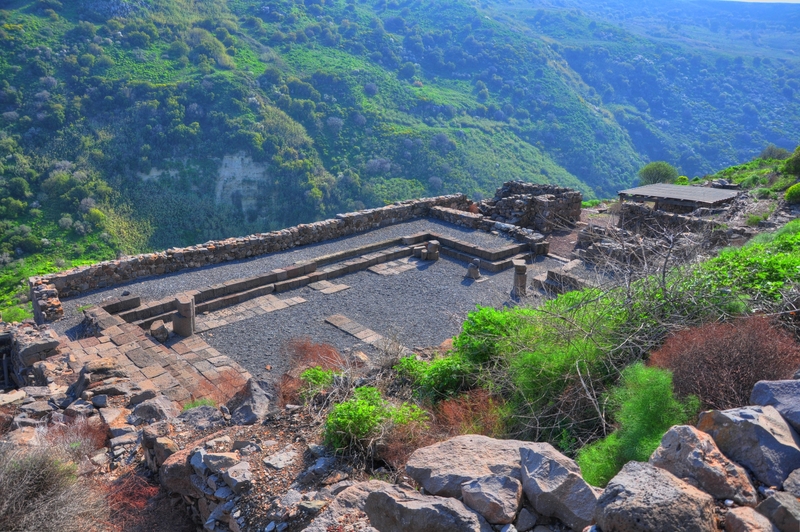 He reassigned the city to the Itureans, an Arab tribe who received parts of the Galilee and the Golan. 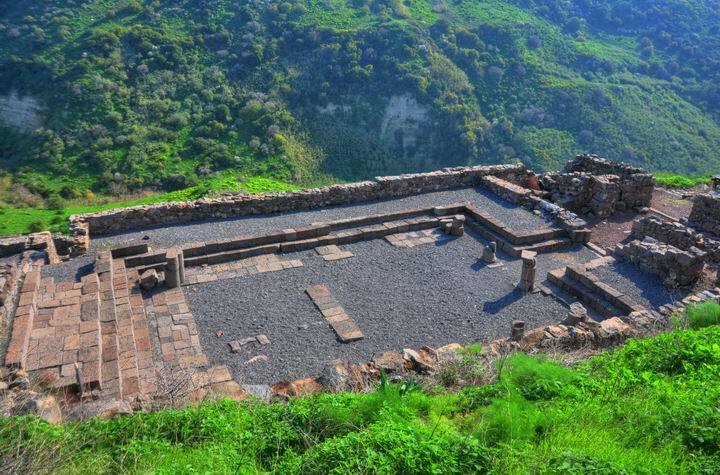 The Itureans are referred in Luke 3,1: "Now in the fifteenth year of the reign of Tiberius Caesar, Pontius Pilate being governor of Judaea, and Herod being tetrarch of Galilee, and his brother Philip tetrarch of Ituraea". In 20BC Augustus Caesar gave the northern Golan, including Gamla, to Herod the Great. During Herod's control of the city a citizen of Gamala, Judas, rebelled against the Romans and inspired the zealots (Antiquities 18 1): "Yet was there one Judas, a Gaulonite, of a city whose name was Gamala, who, taking with him Sadduc, a Pharisee, became zealous to draw them to a revolt...". According to Josephus, these zealots were one of the causes of the revolting attitude that swept the nation into their tragic end: "...the nation was infected with this doctrine to an incredible degree; one violent war came upon us after another". Judas's two sons were executed by the Romans, and another son was one of the rebel leaders in Masada. 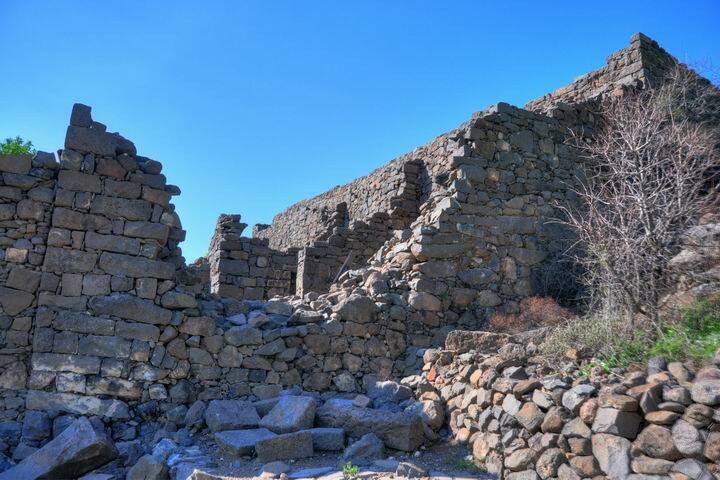 In 66AD Gamala joined the rebels against the Romans, feeling safe within their city (Wars 4 1 1): "Gamala ...relied upon the difficulty of the place...and they had such a confidence in the situation of the place, that they thought the enemy could not be too many for them". 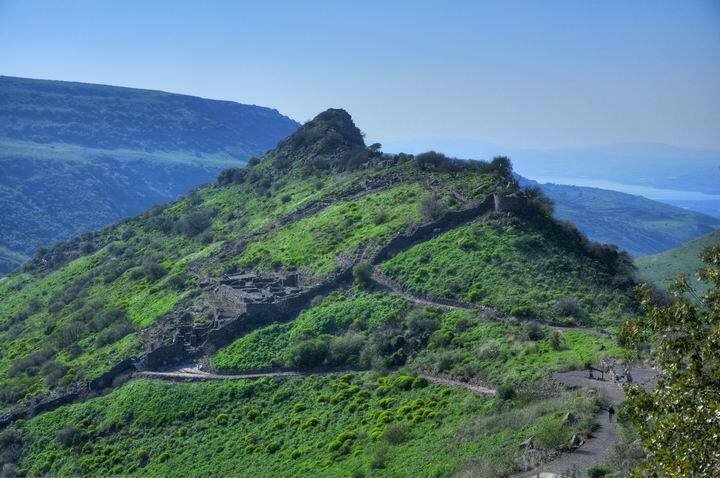 However, Josephus - then the general of the Galilean forces - fortified the city to prepare for the worst. 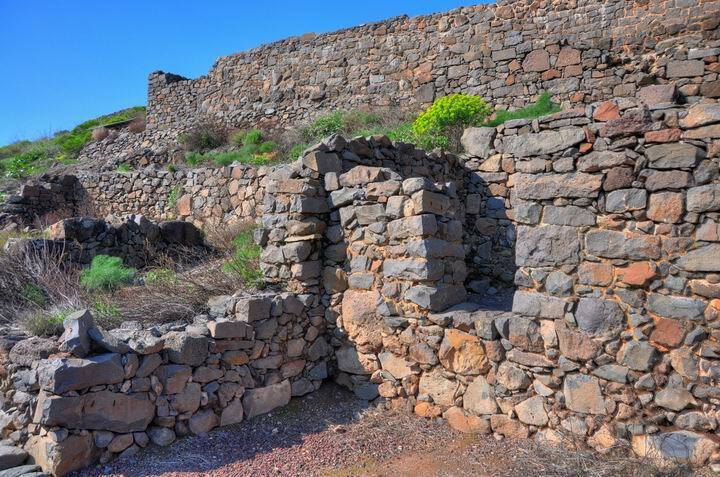 He writes (War 4 1 2): "As this city was naturally hard to be taken, so had Josephus, by building a wall about it, made it still stronger, as also by ditches and mines under ground". King Agrippa II, who controlled the Golan under the Romans, besieged the rebellious city for seven months but failed (Wars 4 1 2): "...Agrippa sent to besiege it for seven months together". The Romans called in three legions, under the command of Vespasian (Wars 4 1 2): "Vespasian ... came to Gamala... he set men to watch it, and seized upon the mountain which was over it. And as the legions, according to their usual custom, were fortifying their camp upon that mountain, he began to cast up banks at the bottom, at the part towards the east, where the highest tower of the whole city was, and where the fifteenth legion pitched their camp; while the fifth legion did duty over against the midst of the city, and whilst the tenth legion filled up the ditches and the valleys". All in all, the defenders numbered 9,000 people (many of them gathered from other villages) who defended the city against the Legions (about 16,000 soldiers), with additional reinforcements of Agrippa's army. 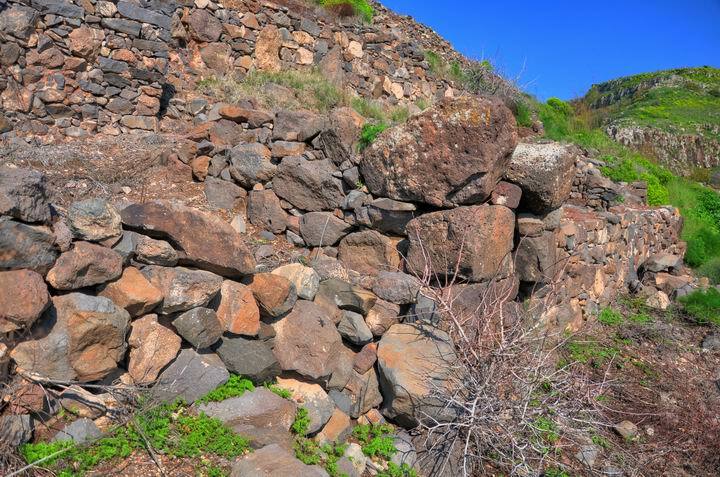 A month later, the Romans managed to breach the wall (Wars 4 1 4): "...the Romans bring battering rams to three several places, and made the wall shake [and fall]". 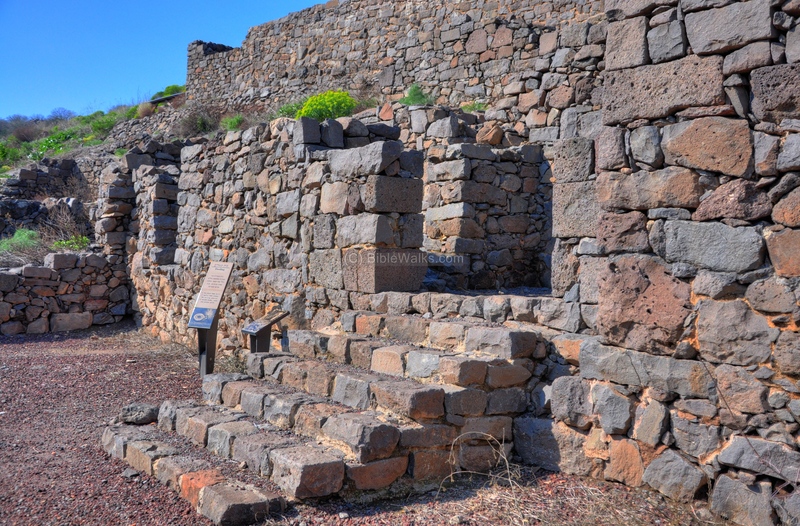 After rushing in, they fell into a trap and most of the Romans were killed inside the city due to the falling houses and the pressure of the defenders: "...By this means a vast number of the Romans perished". However, this victory was short-lived. On the second attempt, a few days later, the Romans managed to topple the round tower (Wars 4 1 9): "...three soldiers of the fifteenth legion, about the morning watch, got under a high tower that was near them, and undermined it...whereupon the tower fell down on a sudden, with a very great noise". The Roman troops breached the walls and overwhelmed the Jewish defenders, costing the lives of all the population. Most of the residents and refugees in the city took their own life by jumping over the cliffs - a tragic end to the mighty city. 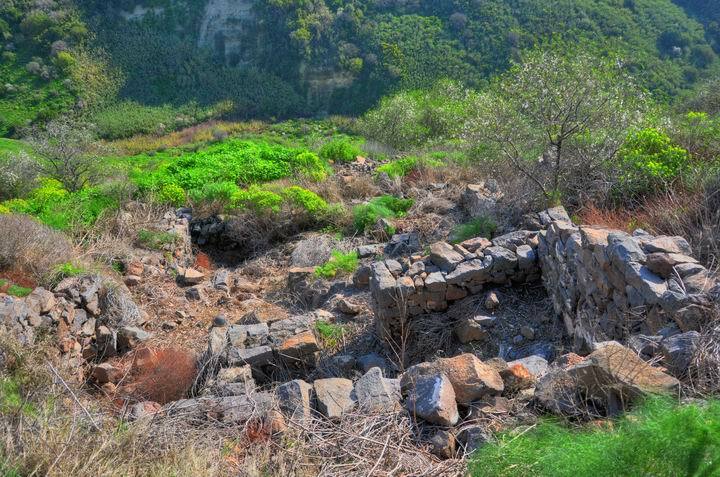 After its destruction, the city was left in ruins for 1900 years, and its location was a mystery. 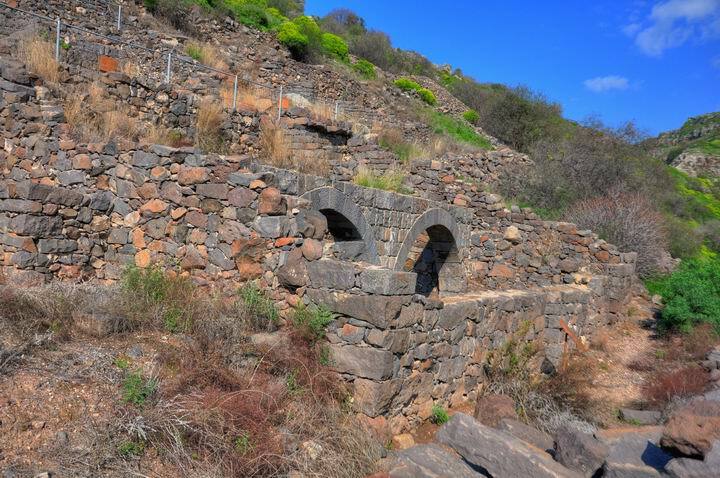 In 1968 it was rediscovered by Yitzchaki Gal during a survey of the Golan, following the six-day-war when the Golan returned to the modern Jewish nation - Israel. The archaeological excavations, directed by Shmarya Guttman, restored parts of the city and confirmed the location of the lost city of Gamla/Gamala. 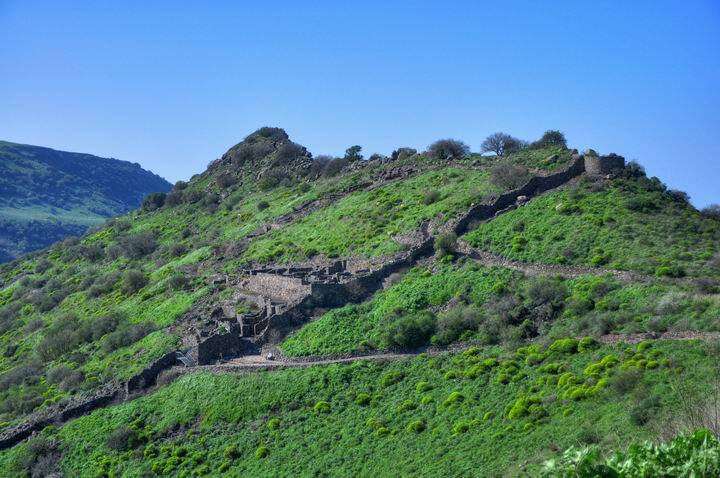 Today the excavated city, and the area around it, is part of a wonderful nature reserve. In addition to the sights of ancient Gamla, there are nature trails, the largest waterfall in Israel, vulture observation, Golan heights memorial, Deir Kuruch Byzantine Church, and more. 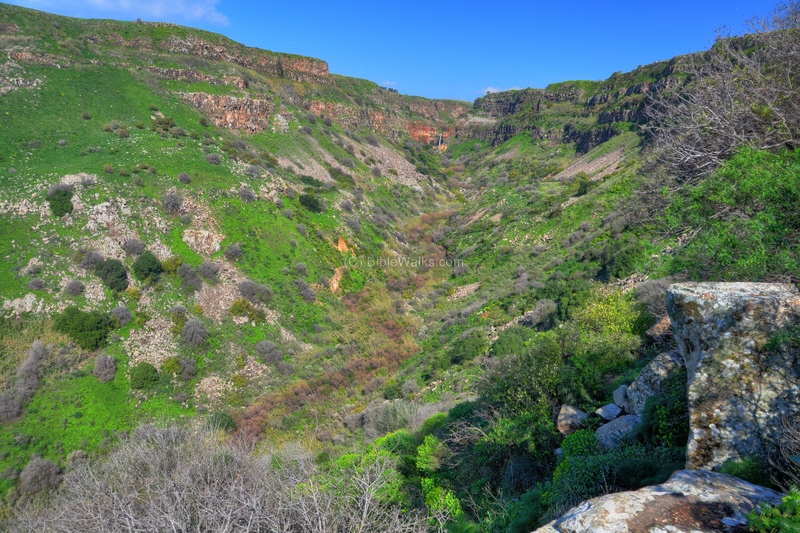 This is one of the most interesting parks in the north of Israel - you should not miss it. A map of the excavation areas and the trails in the site is illustrated in the following map. The areas are numbered by single letters ("A" thru "T"). You can click on the titles on this diagram which will navigate to that section. 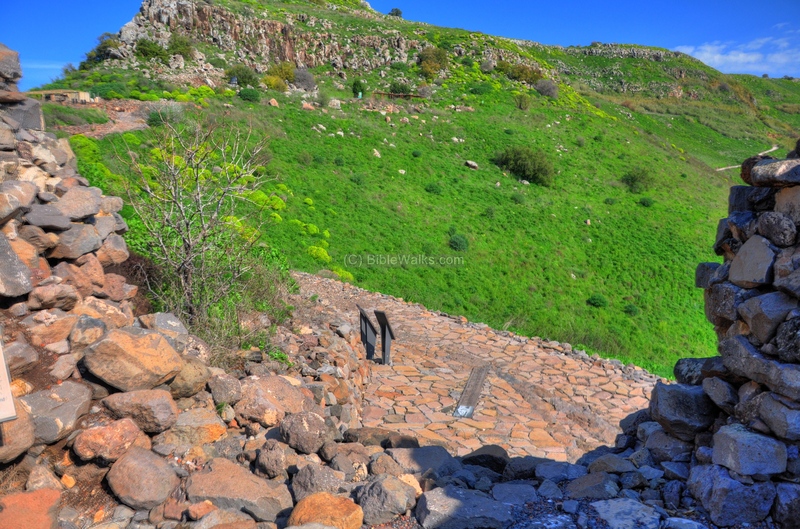 The ancient city ruins cover the south-west side of the hill, which is located between two canyons - the Daliyot stream on the left and the Gamla stream on the right. The hill is shaped like a camel, hence the name of the city. This shape is described by Josephus (War 4, 1 1): "Gamala ... was situated upon a rough ridge of a high mountain, with a kind of neck in the middle: where it begins to ascend, it lengthens itself, and declines as much downward before as behind, insomuch that it is like a camel in figure, from whence it is so named, although the people of the country do not pronounce it accurately. Both on the side and the face there are abrupt parts divided from the rest, and ending in vast deep valleys; yet are the parts behind, where they are joined to the mountain, somewhat easier of ascent than the other; but then the people belonging to the place have cut an oblique ditch there, and made that hard to be ascended also". 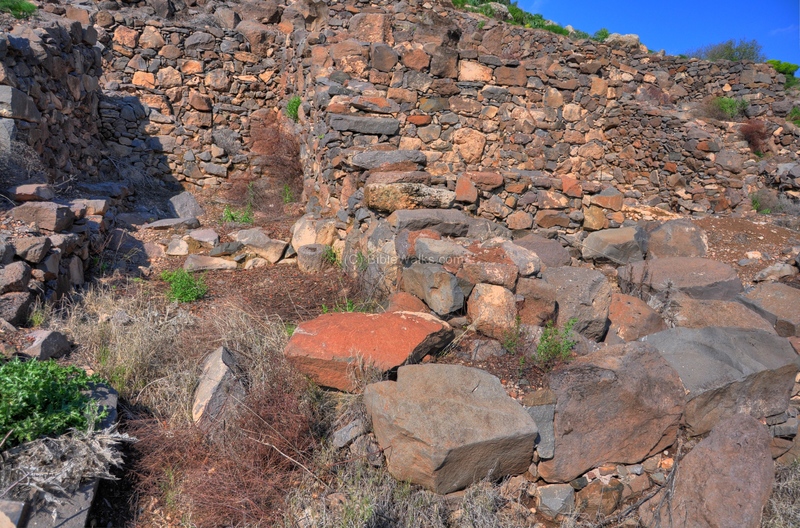 In the following photo is a closer view of the ruins. Josephus continues to write: "On its acclivity, which is straight, houses are built, and those very thick and close to one another. The city also hangs so strangely, that it looks as if it would fall down upon itself, so sharp is it at the top. It is exposed to the south, and its southern mount, which reaches to an immense height, was in the nature of a citadel to the city; and above that was a precipice, not walled about, but extending itself to an immense depth. 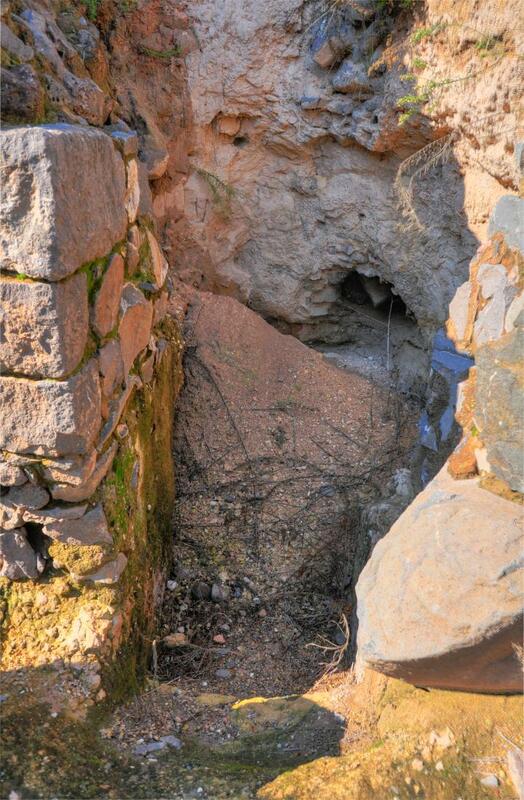 There was also a spring of water within the wall, at the utmost limits of the city". The order of the following sections is counter-clockwise - starting from the eastern section of the city, walking towards the summit, then to the western section, and finally back to the access trail. The eastern wall extends all the way from the round tower on the top to the bottom of the hill near the riverbed of the Daliyot stream. 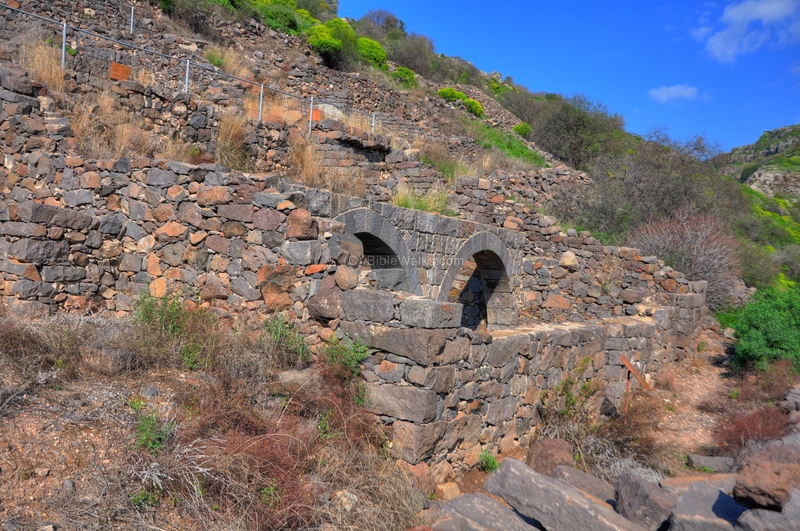 A road leads to the city, passing near a water cistern (located on the right of the sign). The width of the wall varies, with the widest (5.8M) at the location of the synagogue. 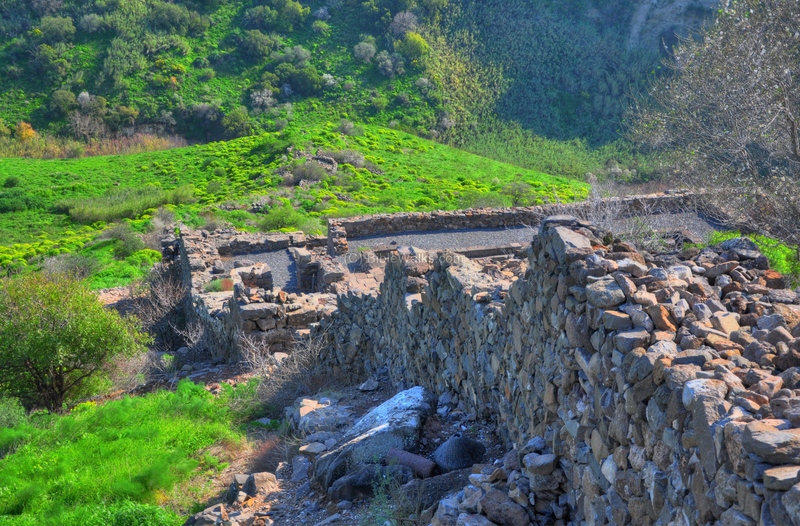 The wall is composed of different stones, since it was built in several stages. Josephus himself helped to strengthen the wall as a preparation to the war. 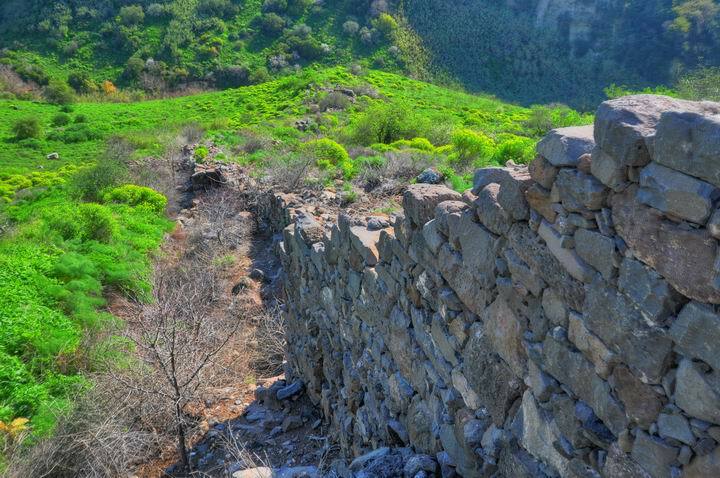 He writes (War 4 1 2): "As this city was naturally hard to be taken, so had Josephus, by building a wall about it, made it still stronger, as also by ditches and mines under ground". A model of a Roman catapult is located on the external side of the wall. 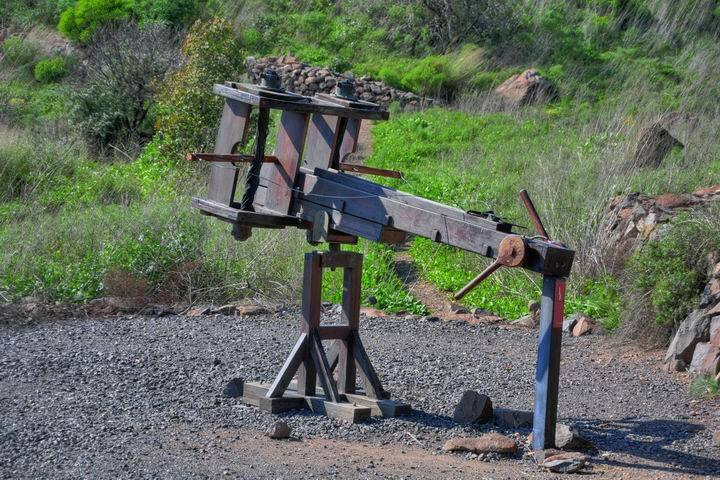 It was used to shoot arrows or bolts on human targets with great force and long range. Josephus (War 4 1 4): "those machines threw darts and stones at them". 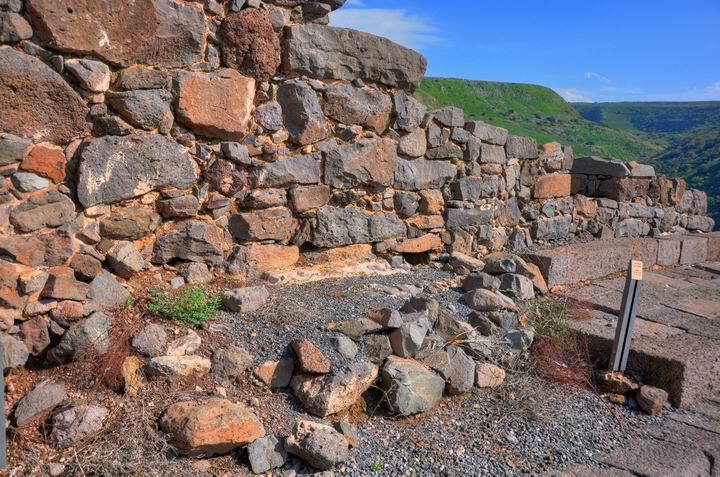 An evidence of the fierce war between the defenders and the Roman legions was found in this section of the wall, where a breach was found at the point the Romans managed to knock down the wall. Josephus (War 4 1 4): "...the Romans bring battering rams to three several places, and made the wall shake [and fall]. They then poured in over the parts of the wall that were thrown down, with a mighty sound of trumpets and noise of armor, and with a shout of the soldiers, and brake in by force upon those that were in the city". However, the soldiers who rushed into the city actually came into a trap (War 4 1 4): "...but these men fell upon the Romans for some time, at their first entrance, and prevented their going any further, and with great courage beat them back; and the Romans were so overpowered by the greater multitude of the people, who beat them on every side, that they were obliged to run into the upper parts of the city. Whereupon the people turned about, and fell upon their enemies, who had attacked them, and thrust them down to the lower parts, and as they were distressed by the narrowness and difficulty of the place, slew them"
This following picture shows the view of the breach in the wall from the interior. Josephus continues to describe how the Romans were pushed into a trap, and the houses seen below fell over them and crushed the attack: "... and as these Romans could neither beat those back that were above them, nor escape the force of their own men that were forcing their way forward, they were compelled to fly into their enemies' houses, which were low; but these houses being thus full, of soldiers, whose weight they could not bear, fell down suddenly; and when one house fell, it shook down a great many of those that were under it, as did those do to such as were under them. By this means a vast number of the Romans perished; for they were so terribly distressed, that although they saw the houses subsiding, they were compelled to leap upon the tops of them; so that a great many were ground to powder by these ruins, and a great many of those that got from under them lost some of their limbs, but still a greater number were suffocated by the dust that arose from those ruins". Behind the breach in the wall is a number of residential houses. The base of a 2 story house is seen below, built of partly hewn (smoothly cut) stones. The interior of this house is seen below. In the center of the wall is a cupboard. 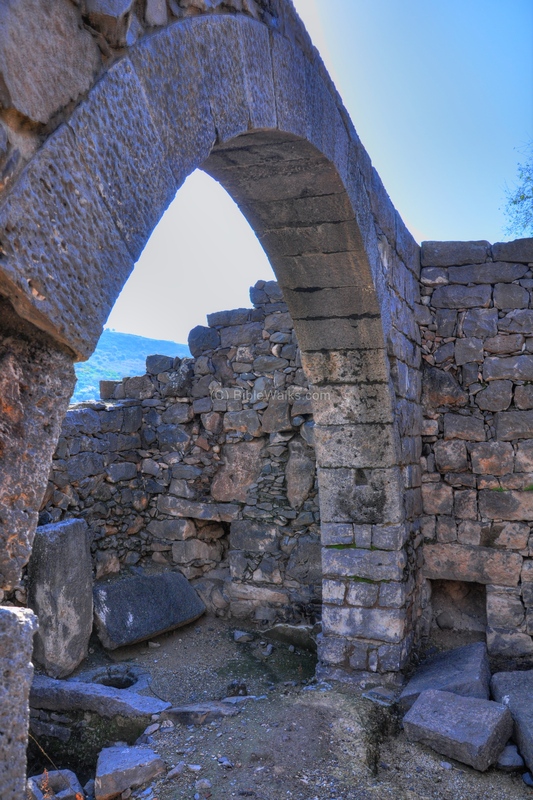 On the northern side of the room is a line of corbels (or console) - a piece of stone jutting out of a wall in order to hold the wooden floor of the second story. The floor was made of wood beams, reed mats and compacted earth. Another side of this dwelling place is seen in the next picture. 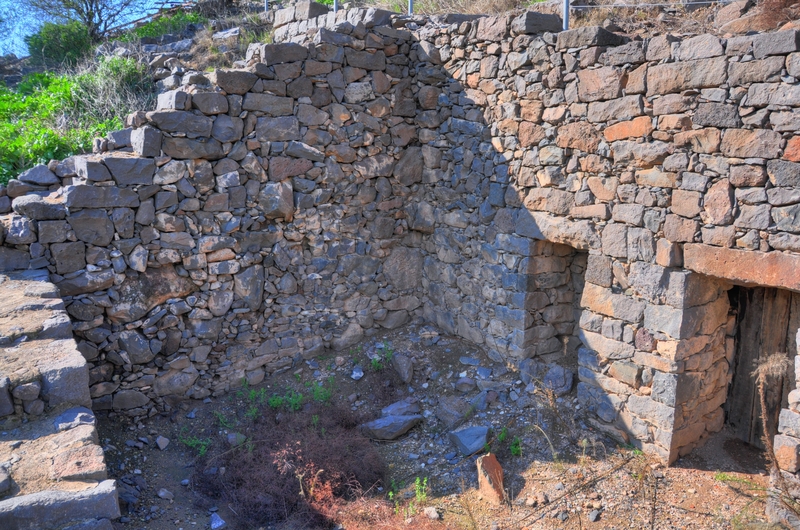 Above it is the wall of the synagogue. Above the house was a paved road, which originally was one of the open gates to the city. Josephus sealed these roads and incorporated it into the great wall. A large (16 x 20M) synagogue was located on the eastern part of Gamla, as indicated with a red square on the right. Its north-east wall incorporated into the great defensive wall. 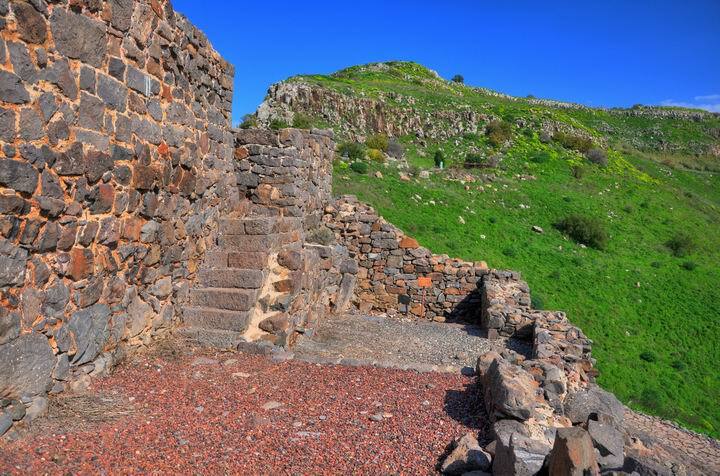 The synagogue was erected in the beginning of the first C AD, at the time of the Second temple, and is one of the oldest synagogues found. Its direction is northeast (rear side) to south-west (front side), aligned with the slope of the hill. This orientation is uncommon, since all synagogues are oriented to Jerusalem and face east. However, this is due to the local topographical limitation and the builders had to compromise in order to erect a monumental structure. The colonnaded structure was based on 16 columns, which supported the roof. The floor of the structure is not paved, but along its circumference is a pavement of basalt tiles between the bases of the columns and the row of seats around them. 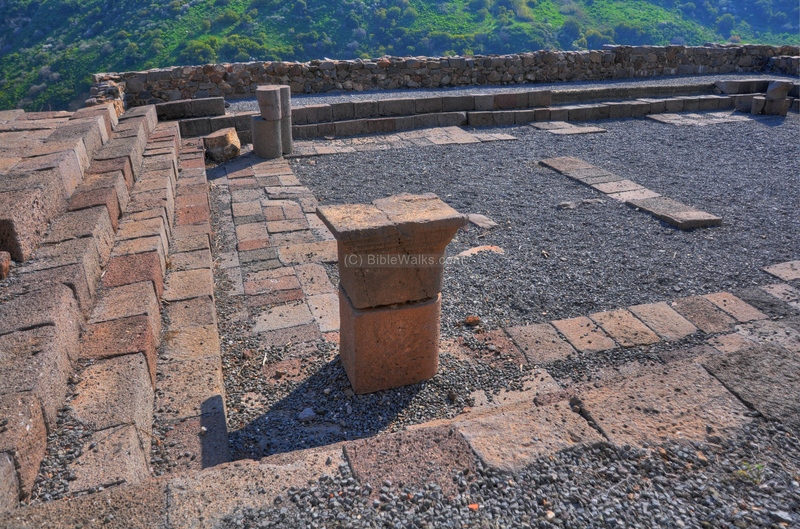 A single line of tiles cross the floor, perhaps serving as the base ("stylobate") of other columns that supported the roof. This line, at the rear of the synagogue, implies that the roof covered only the front (right) side of the structure. The corner columns are shaped like hearts - a common design found in other Galilee synagogues (such as Kh. Ammudim). 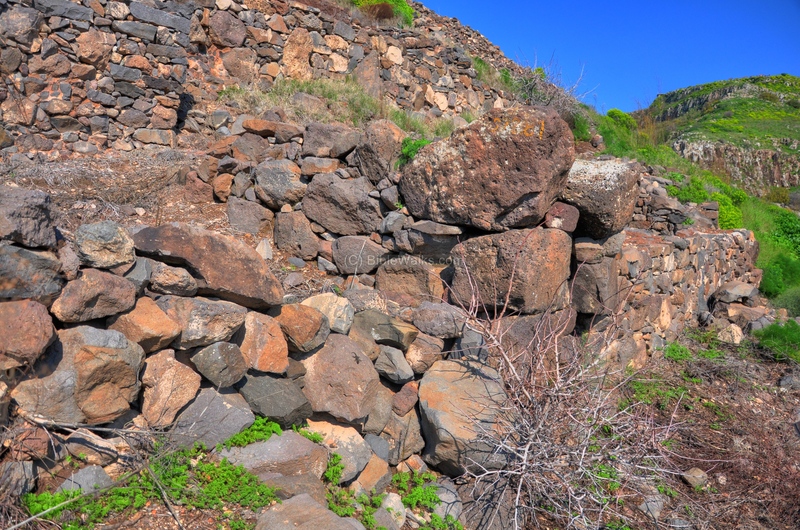 The structure was adjacent to the eastern wall. 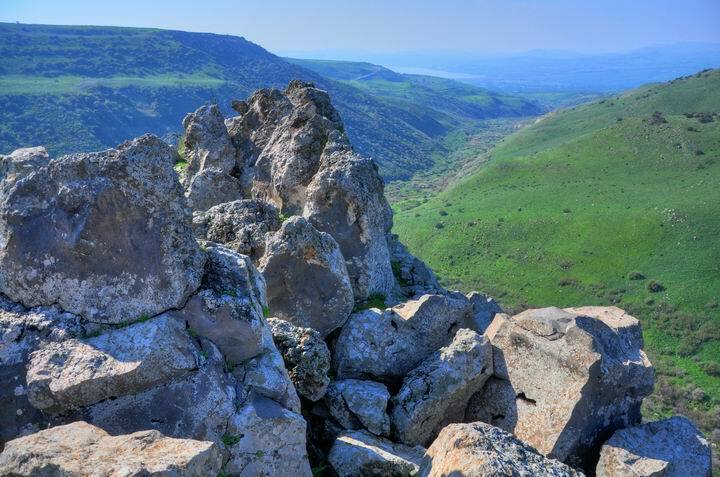 The excavators found here many catapult arrowheads which testify that a fierce battle was conducted at this site. A stage, 1.8m high above the floor, was located on the north-east wing (the synagogue's rear side). Four steps led down to the floor level, and a fifth stair was located behind it. The steps, which originally surrounded the entire structure, served as seating places for the public. On the left side of the stage is the bases of a cupboard which may have stored the holy books. In the hidden corner is a place of a basin for washing hands. The front side of the synagogue faced the south-west. Two entrances are located there - a lower, larger center door which opened to the hall, and a smaller door on the west side which led to a raised stage. 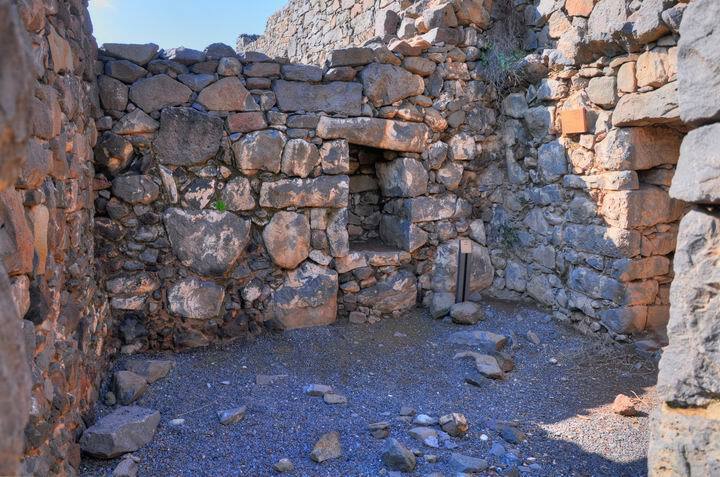 A niche for the sacred Torah books is located in the wall on the left side of the raised side entrance. On the front side of the synagogue, surrounding the front door, are several rooms that serviced it. On the south-west side of the synagogue was a ritual bath house - the Mikveh (Hebrew for source of water) - also known as a baptismal. 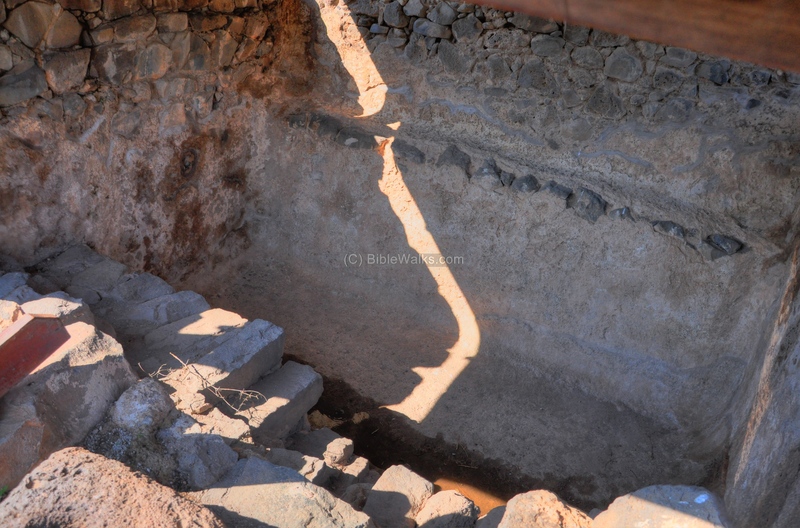 Four steps lead to the bottom of the pool (4.5m x 4m), where the synagogue visitors would bath and cleanse themselves by immersion in the pool. 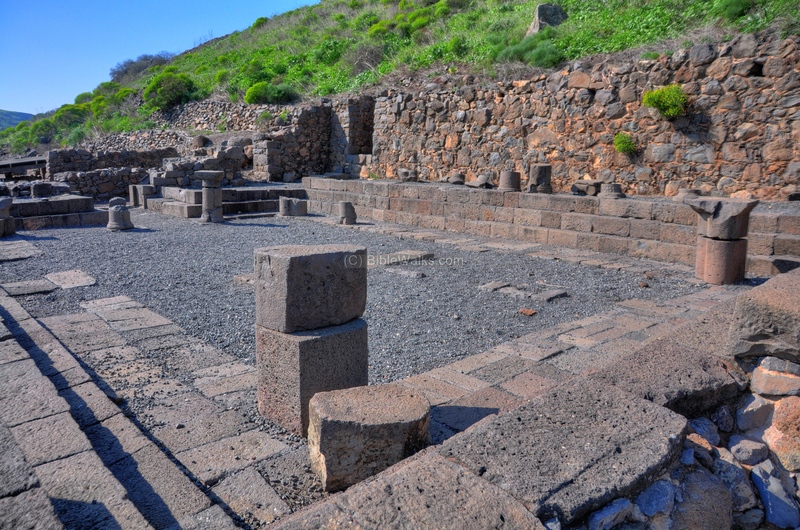 The picture below is a view of the bathhouse and the synagogue behind it. 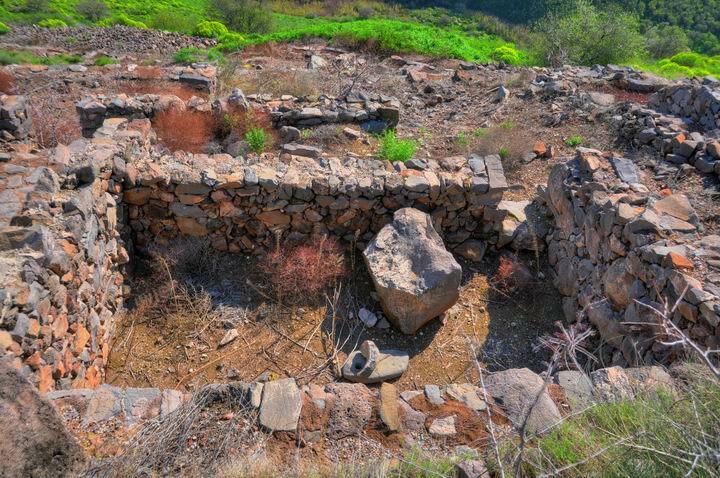 Remnants of a structure dated to the Early Bronze age (3,100BC - 2,500BC) are located south of the synagogue. Other findings in Gamla provided evidence of the older period of settlement. The large number of Dolmens on the northern cliff, used by the prehistoric men as tombs, indicate a substantial period of settlement in that early period. 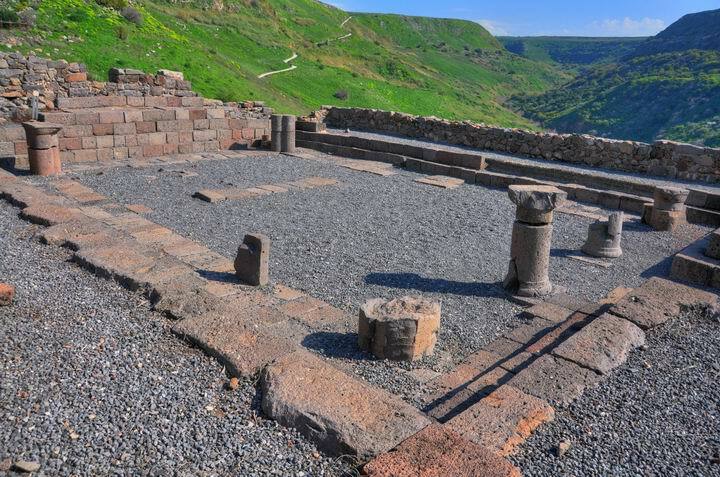 At a higher level above the synagogue are traces of ruins from the first century BC, during the period of the Hasmonean kingdom. This area, marked as a red square, was not inhabited at the time of the great revolt against the Romans. Several structures, ritual bath and oil press were excavated here. 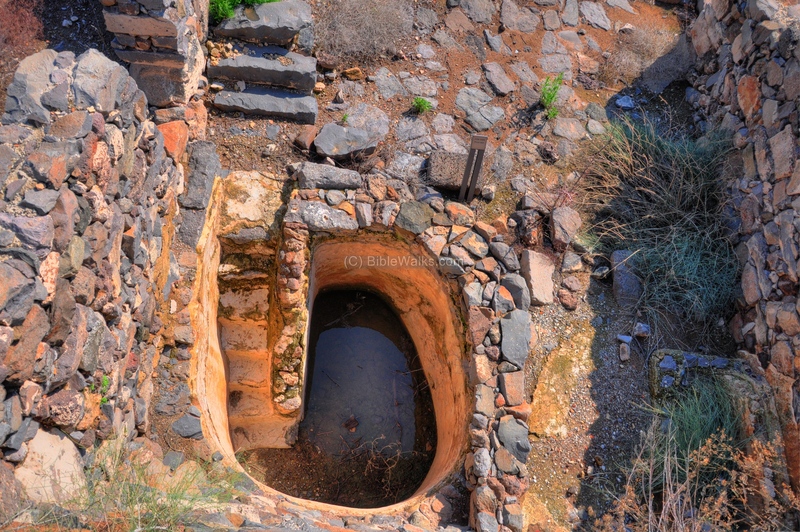 A ritual bath in the form of a tub is located at a lower side of this quarter. A reconstructed residential house is adjacent to the tub. 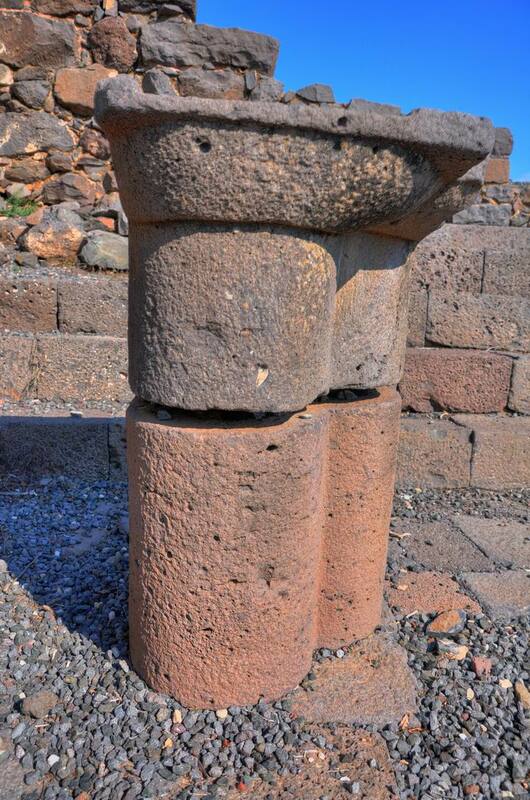 At a higher level are more residential structures, with an oil press located on its north side. 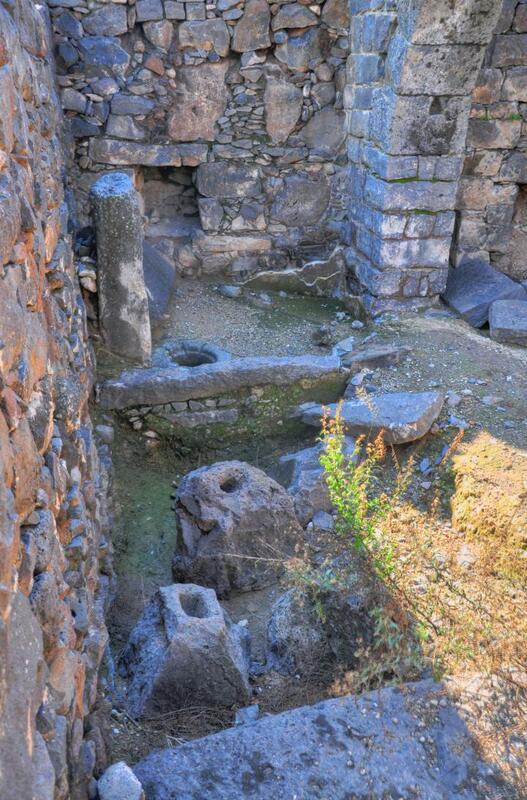 This oil press, dated to the 1st C BC, is based on a lever based press design ("type 4"). 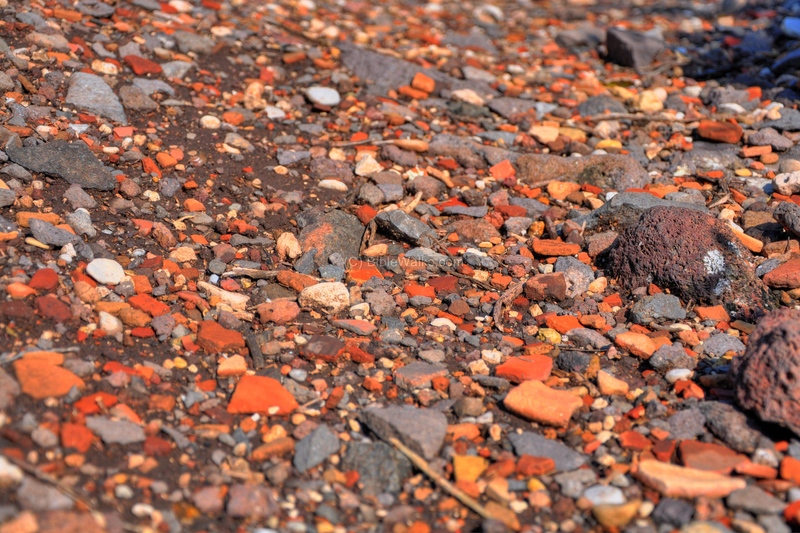 A total of 6 weights were found here (three are seen in the photo). 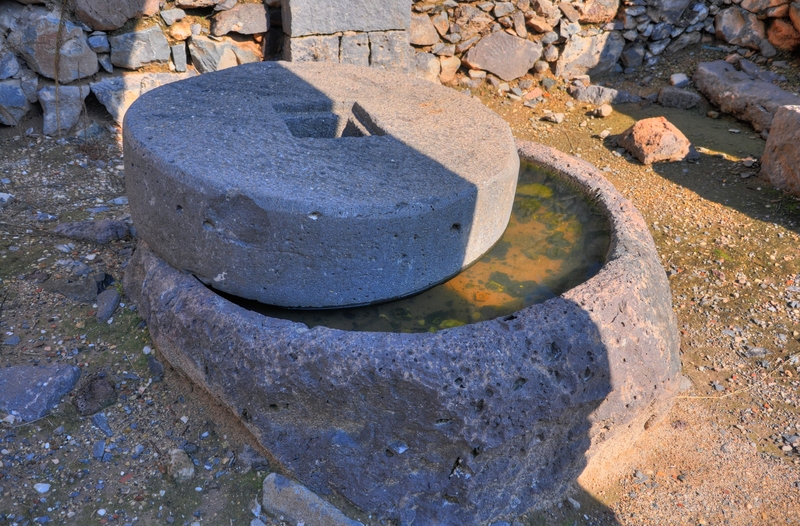 In this oil press, the olives were first crushed using a round crushing stone and basin. Only the crushing stone ("type 3.8.3") was found here. Then, the oil press extracted their oil, based on stone weights which were tied to the edge of the wooden lever, pushing the lever down. The force of the lever pushed a flat stone down on a basket, which contained the crushed olives. The stone squeezed the basket, pressed on the olives, extracting the precious olive oil unto the round grooves of a basin stone. The juice flowed down along these grooves, out through an outlet in the basin, and down into a collecting vat. The olive juice contained water and oil. After a few days, the lighter oil in the juice floats above the water, and it is then collected and stored in jars. 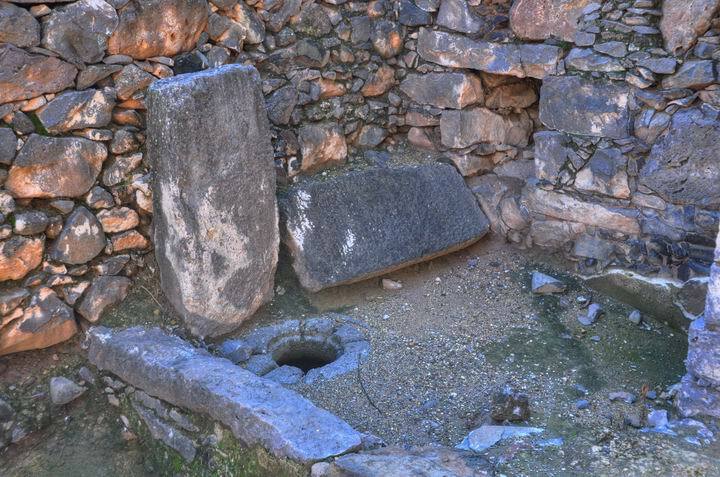 One of the two basins is seen in the picture. 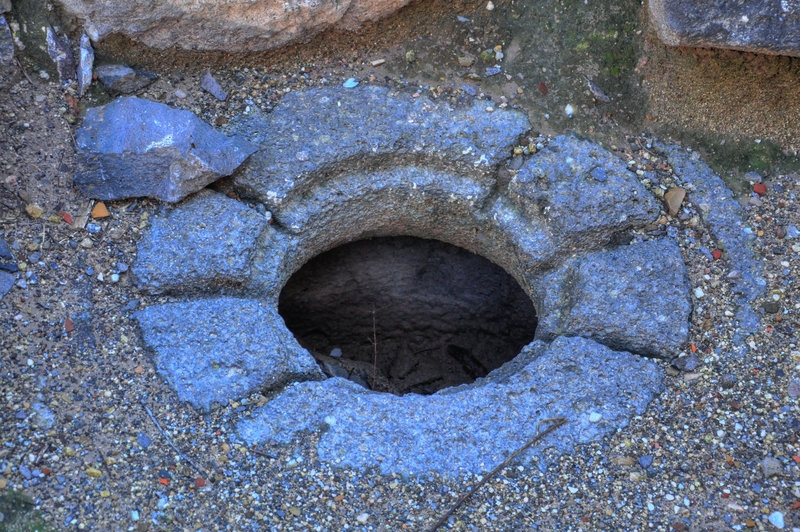 The next picture shows a top view of the second basin, with the crushing stone on the top. 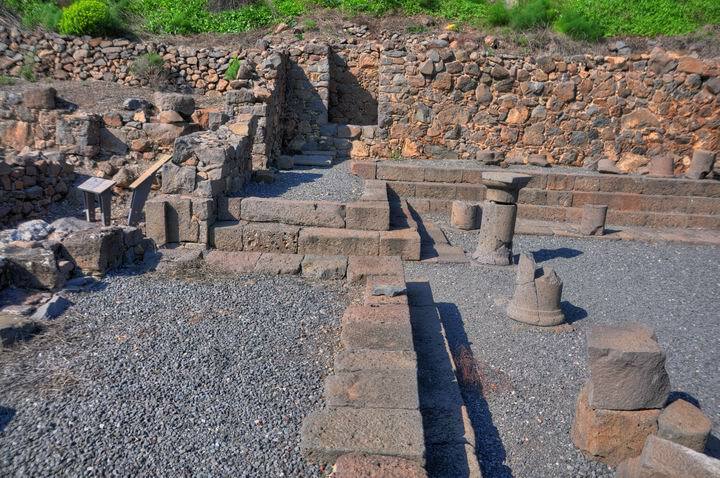 Note that another oil press is located in Area R on the south-western side of Gamla, dated to the Roman period (1st C AD). 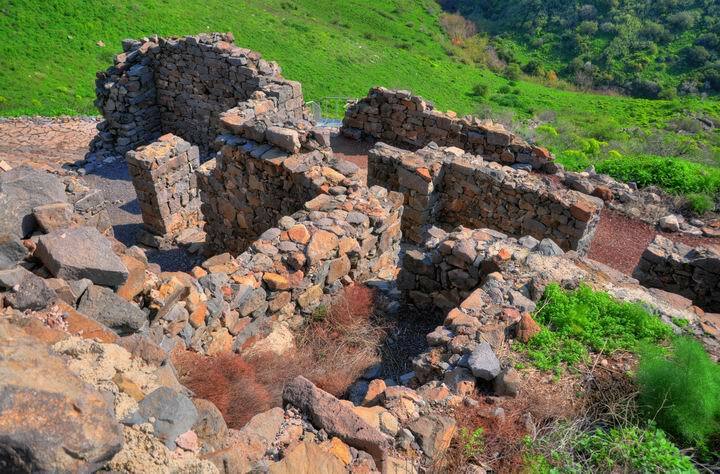 Above the oil complex are more reconstructed dwellings dated to the Hasmonean period. On top of the ridge are a number of excavated structures. Their location, called Area "D", is illustrated with a red square on the right. A view of some of their walls is shown in the photo below. 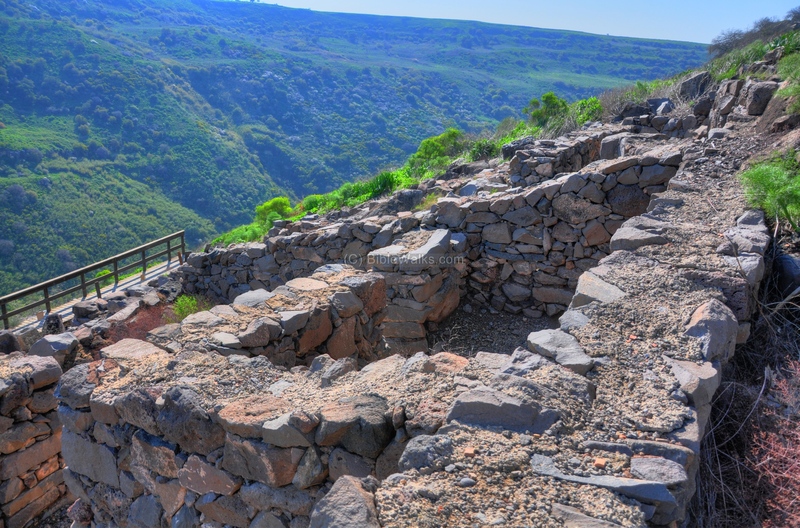 The structures overlook the abyss of the Gamla stream canyon. Along the edge of the ridge there is no wall as on the eastern side. 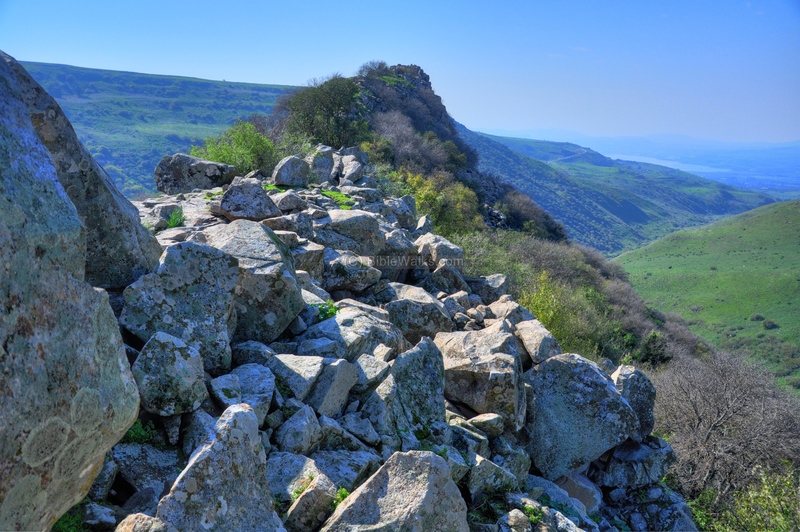 Josephus wrote about this (Wars 4 1 1 ): "and above that was a precipice, not walled about, but extending itself to an immense depth". The round outlook tower is located on the north-eastern edge of the ridge. Its location is marked as a red square on the photo on the right. 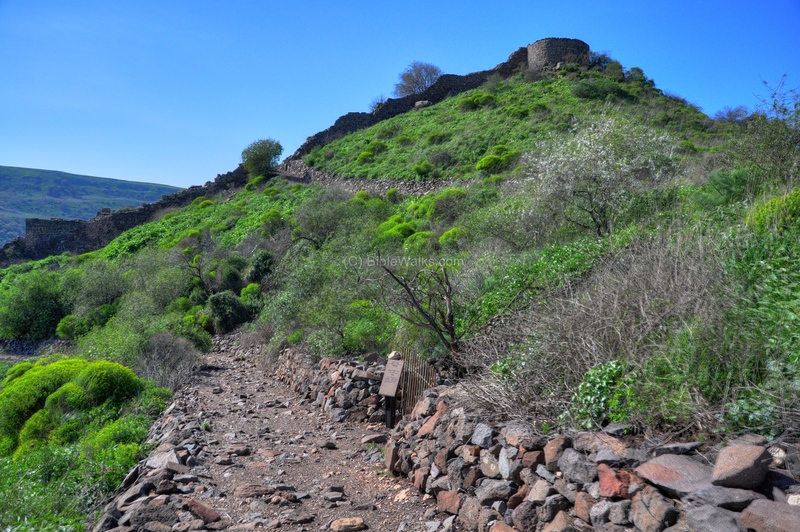 The tower was built before the fortifications of the great revolt. 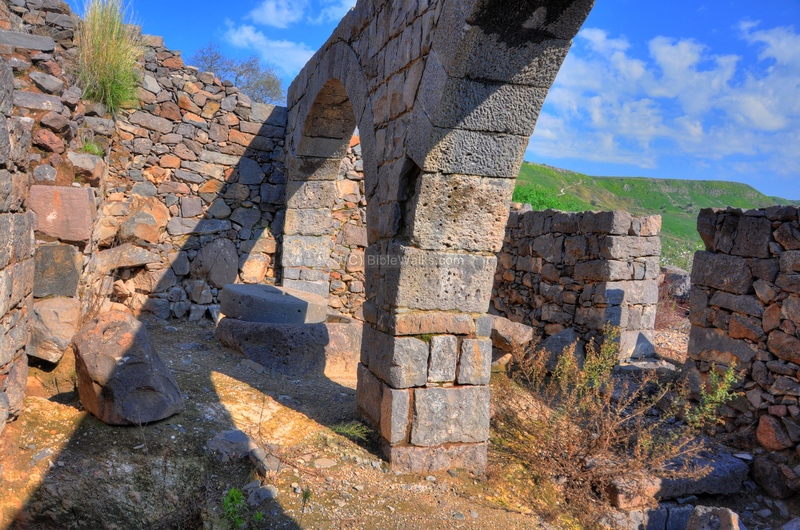 This structure is without foundations and collapsed during the Roman attack. The photo below shows a view from the north-east side. Josephus describes the fall of the tower (War 4 9): ".... the two and twentieth day of the month Tisri, when three soldiers of the fifteenth legion, about the morning watch, got under a high tower that was near them, and undermined it, without making any noise; nor when they either came to it, which was in the night time, nor when they were under it, did those that guarded it perceive them. These soldiers then upon their coming avoided making a noise, and when they had rolled away five of its strongest stones, they went away hastily; whereupon the tower fell down on a sudden, with a very great noise, and its guard fell headlong with it;". A view from the reconstructed tower is shown below. On the top of the hill is the lookout area of the visitors center. 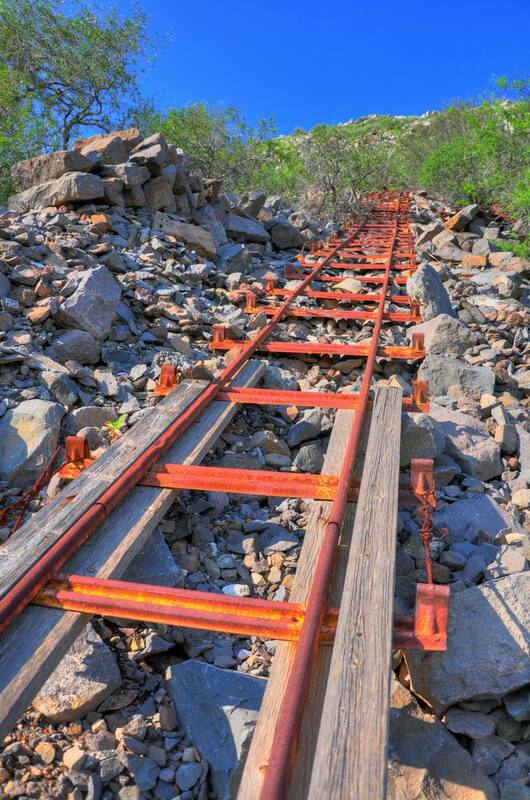 The ancient winding trail climbs up this steep cliff. From the tower is a great view of the eastern wall. 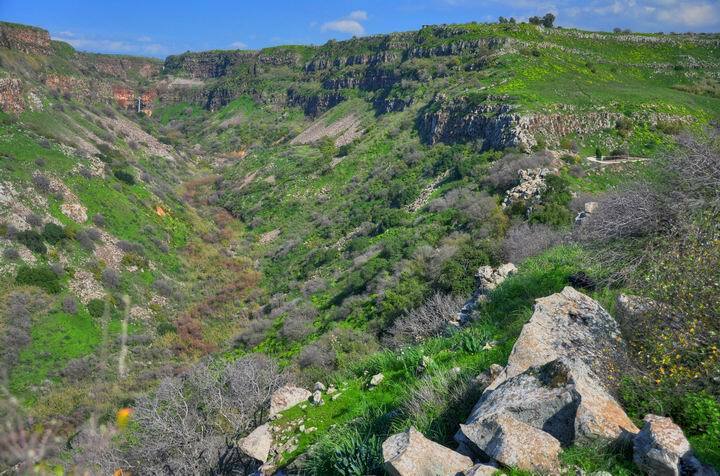 On the edge of the wall, more than 250M away, is the course of the Daliyot stream. Returning back to Josephus accounts (War 4 1 10) you can see the flight of the helpless residents after the Romans toppled the tower and entered to the city: "...some of them caught hold of their children and their wives, and drew them after them, and fled away to the citadel, with lamentations and cries, while others of them went to meet Titus, and were killed perpetually; but so many of them as were hindered from running up to the citadel, not knowing what in the world to do, fell among the Roman guards, while the groans of those that were killed were prodigiously great every where, and blood ran down over all the lower parts of the city, from the upper. But then Vespasian himself came to his assistance against those that had fled to the citadel, and brought his whole army with him; now this upper part of the city was every way rocky, and difficult of ascent, and elevated to a vast altitude, and very full of people on all sides, and encompassed with precipices, whereby the Jews cut off those that came up to them, and did much mischief to others by their darts, and the large stones which they rolled down upon them, while they were themselves so high that the enemy's darts could hardly reach them.". On the western side of the ridge is the highest point. Its height is 330m above sea level. The peak is indicated by a red square at the right. Walking along the edge of the ridge towards the south-west peak is a rewarding experience. A trail leads from the tower to the south west. Along the trail are outstanding views of the area. However, this beings back a chilling memory of the tragic end of the siege. 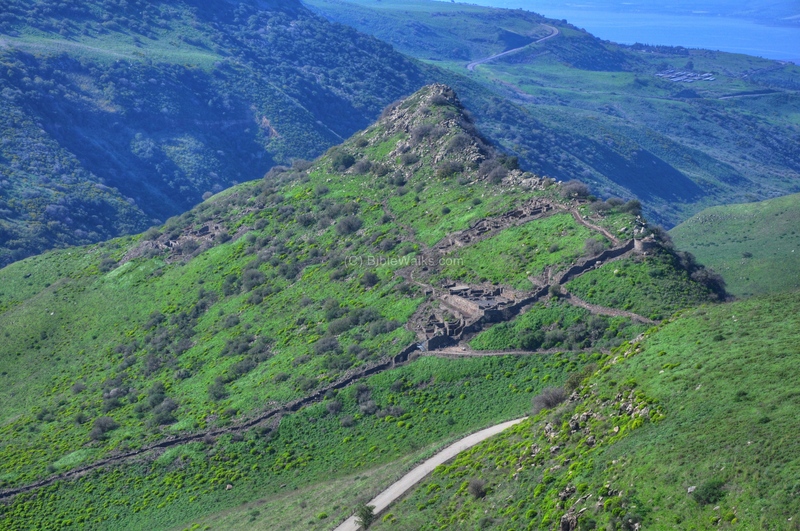 Josephus tells us that 5,000 people leaped over the cliff to avoid their tragic end by the Roman troops (War 1 10): "...a great number also of those that were surrounded on every side, and despaired of escaping, threw their children and their wives, and themselves also, down the precipices, into the valley beneath, which, near the citadel, had been dug hollow to a vast depth; but so it happened, that the anger of the Romans appeared not to be so extravagant as was the madness of those that were now taken, while the Romans slew but four thousand, whereas the number of those that had thrown themselves down was found to be five thousand". Along the trail we saw a Hyrax (rock rabbit, or Hebrew: Shafan Sela) which is a typical mammal in the Golan and the Galilee. 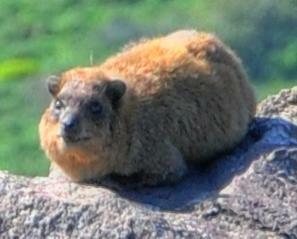 This specific specie is called Syrian Rock Hyrax. 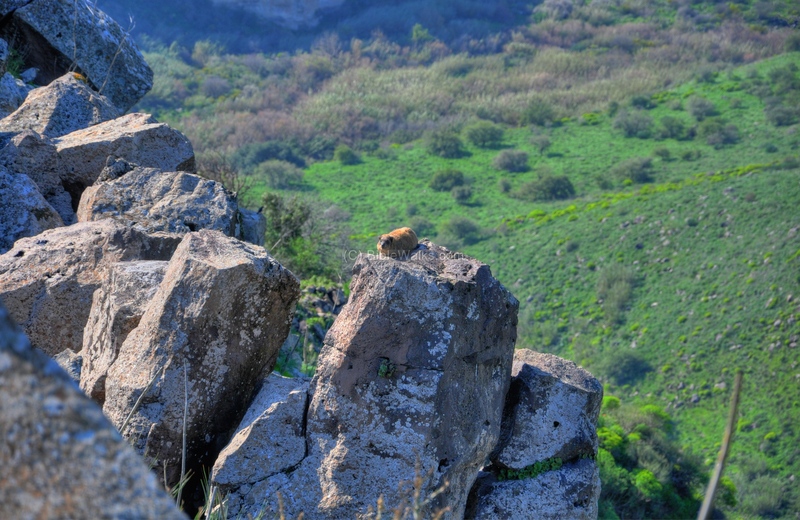 The Hyrax is mentioned in KJV Bible as coney (an English word for rabbit, "Shaphan" in Hebrew), as in Leviticus 11 5:"And the coney, because he cheweth the cud, but divideth not the hoof; he is unclean unto you". 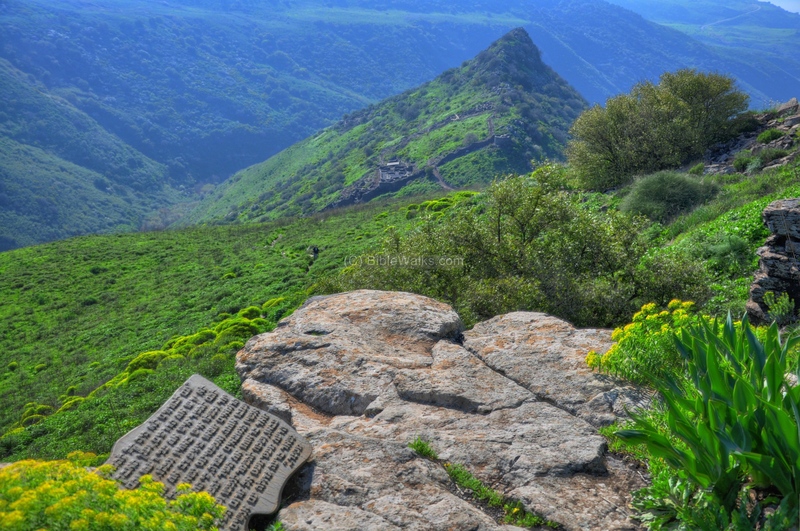 Finally, reaching the peak, all you have to do is sit on the rocks, bath in the sun like a hyrax, and enjoy the view. 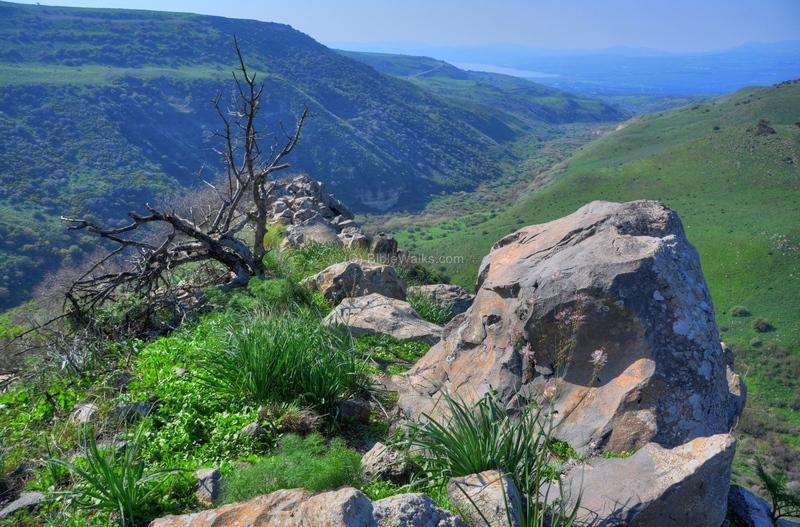 The edge of the ridge overlooks the Gamla stream, which is a rich avian world with many species of birds. The year-round birds include the Goldfinch, Crested Lark, Rock Dove, Sunbird, Blue Rock Thrush and more. The winter time birds migrate here from Europe, and include the White Wagtail, Black Redstart, Stone chat, Robin and more. 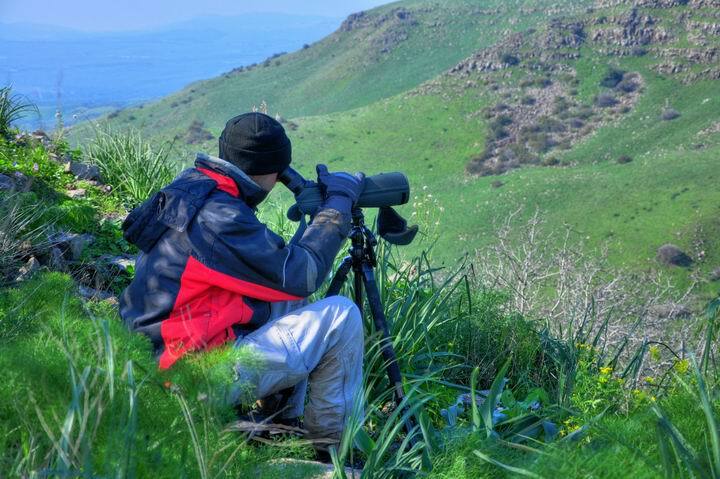 The summer birds include the Spanish sparrow, woodchat shrike, Rufous Warbler, Black Eared Wheatear, little Swift and more. Other birds pass by during the winter and spring migration seasons. Bird watchers come here from all over the world, such as James from UK. 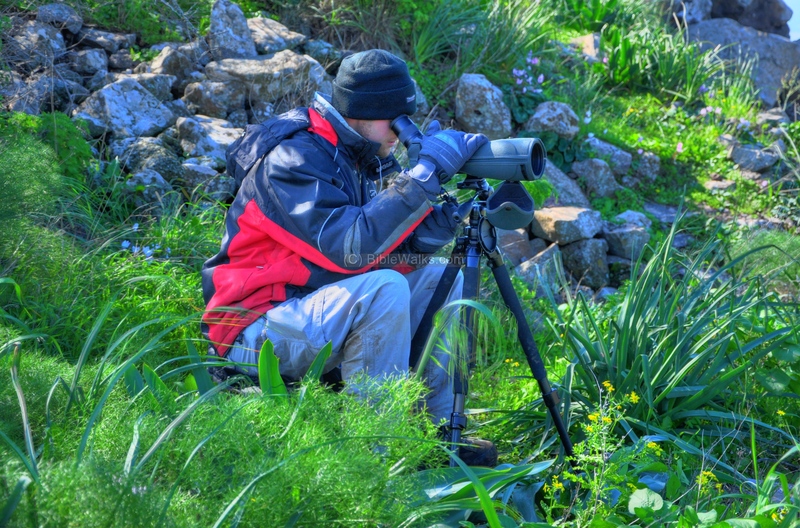 Of special interest is the colony of birds of prey, since the largest nesting colony is found in this reserve. 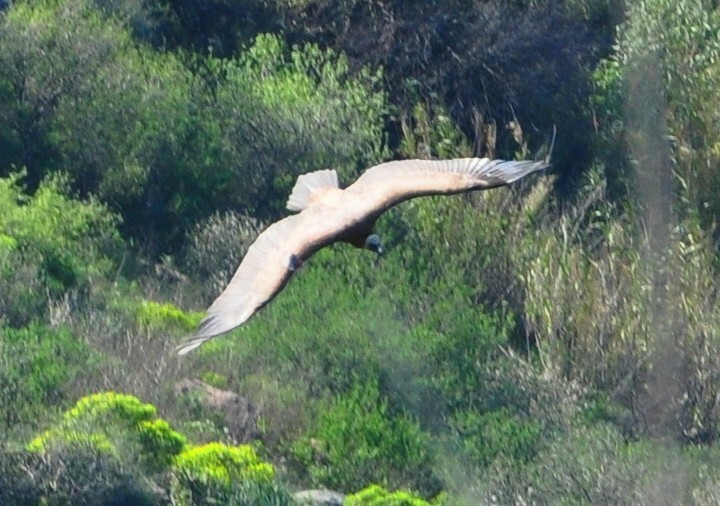 The birds of prey include Griffon Vultures, Egyptian Vultures, Short-Toed eagle, and Long-Legged Buzzard. They nest in the cliffs of the Gamla reserve and fly over the canyon and along the ridge. The eagles are mentioned in numerous times in the Bible, and are often a allegory for swiftness and might. Jeremiah 48 40: "For thus saith the Lord; Behold, he shall fly as an eagle, and shall spread his wings over Moab". 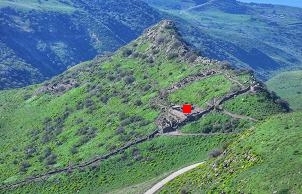 On the western side of Gamla are two excavation areas - R and S. Their location is indicated as a red square on the right. In these areas the excavators found luxurious buildings, shopping center, oil press and a public structure. 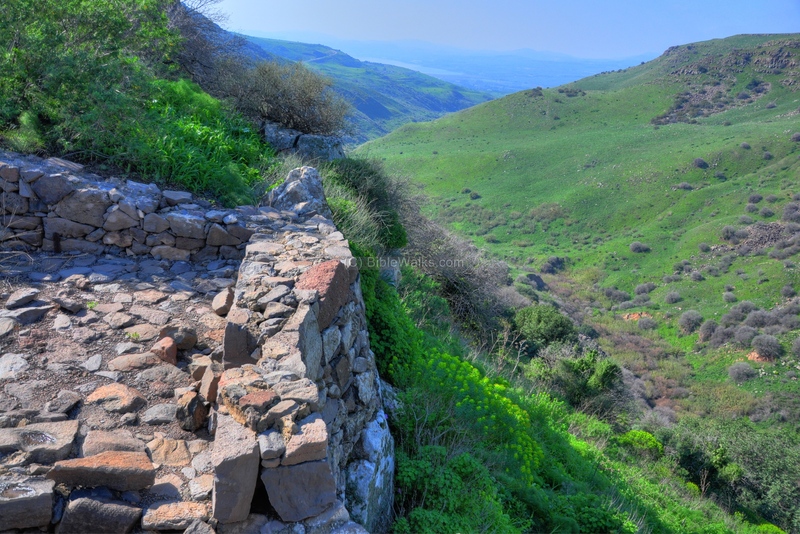 A view from the top of Area R towards the Daliyot stream is shown below. 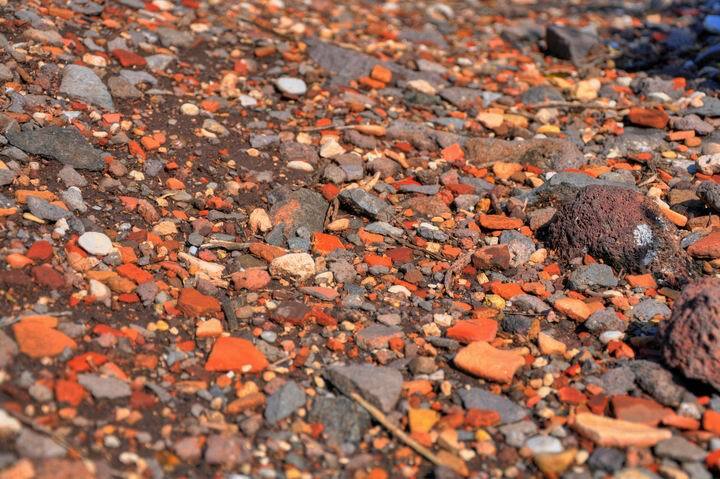 The whole area, including the area near the ridge, is scattered with a huge number of ceramic fragments. This heavy concentration indicates that Gamla was a major city with thousands of residents. The quality of the structures and the pavement indicates that this was a wealthy section. This residential house is also seen from the north side. The steps on the far side lead to its second story. The walls and floor of the large room were plastered, partly decorated with stucco. Elements of a flour mill is seen in the nearby structure. 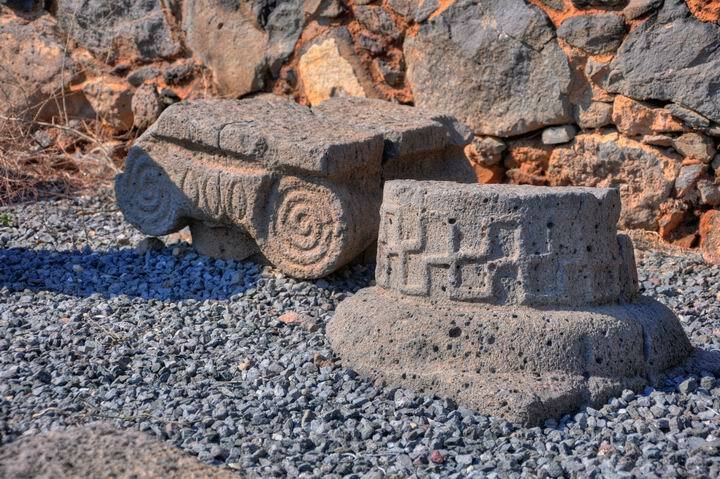 These stones are used to grind the wheat grains and make bread. 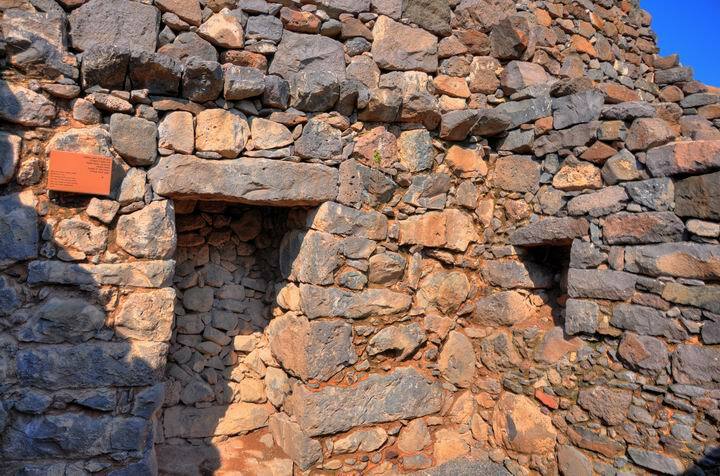 A cave behind the wall was used to store the flour and the grains. 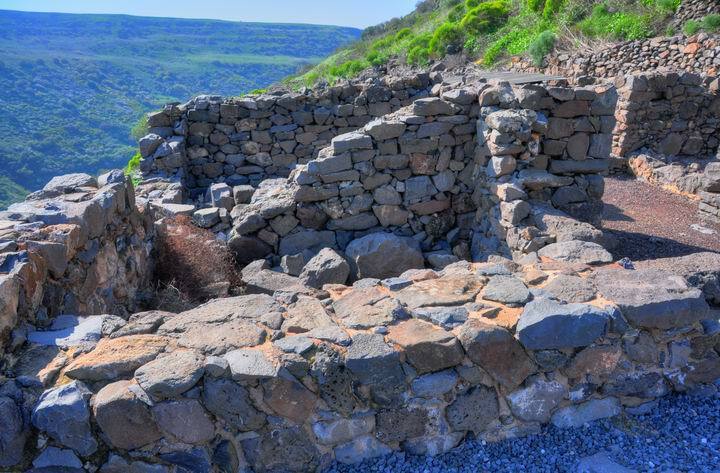 Under the cave was a Bronze age burial site, which was filled up when the house was built. 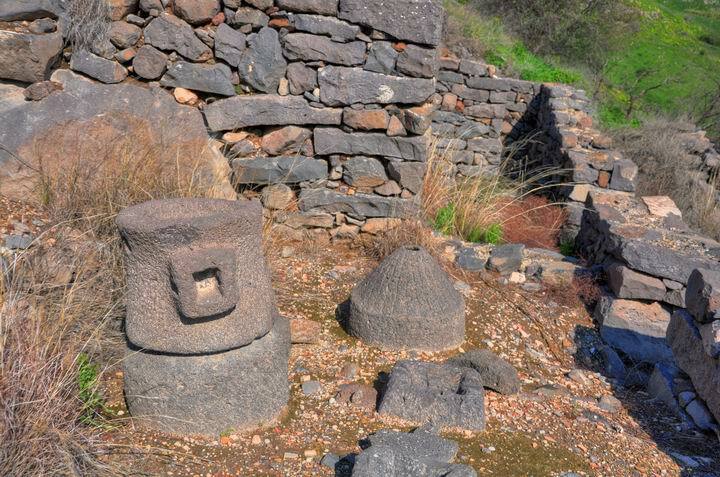 The following picture shows the flour grinding stones from the other side. A grand staircase, partially seen in the back of the grinder, led down here and further down to the oil press. The mill, the rooms around here and the olive press below - all these indicate a possible shopping center. 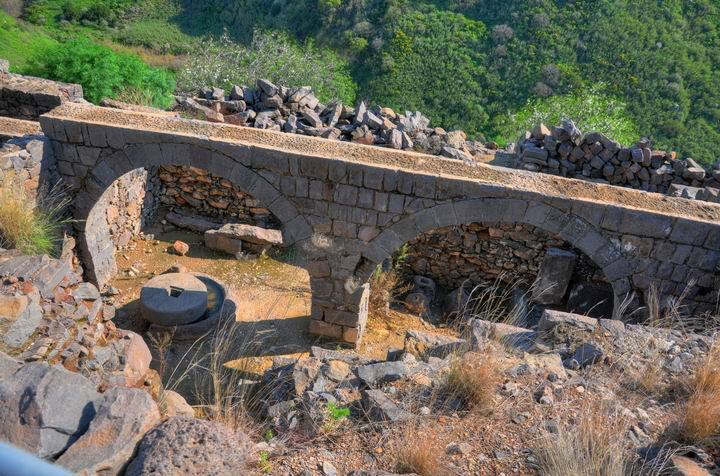 In the lower side of the photo is the lower millstone - a type called "Pompeian" (or: Donkey mill). 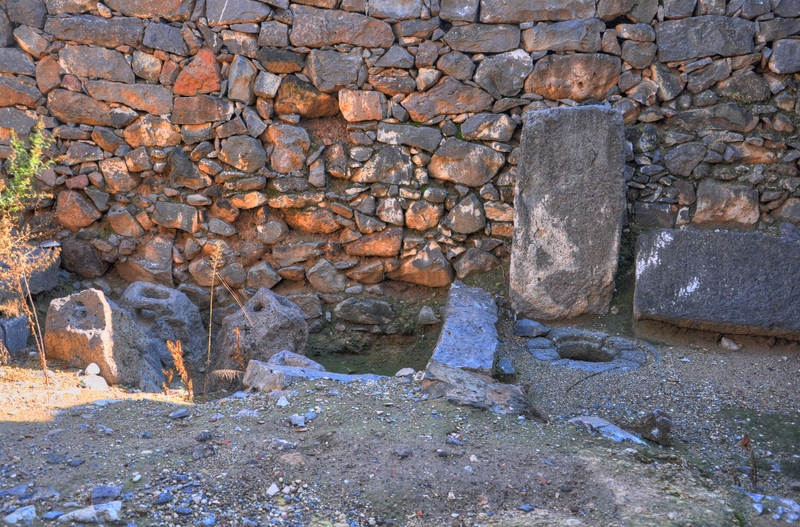 The pair of stones behind it are a complete set - with both the upper and lower millstones. 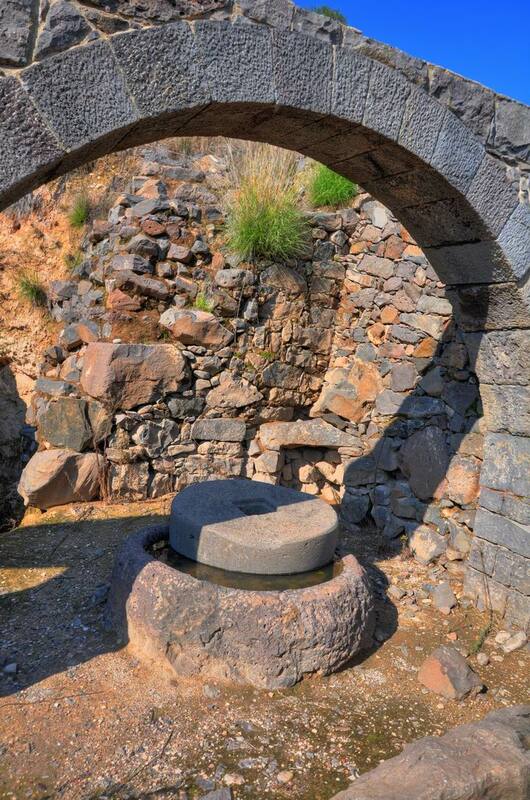 The process of the grinding was as follows: the wheat grain was placed into the top hole, then the upper millstone was turned around, and the ground grains would fall to the bottom. 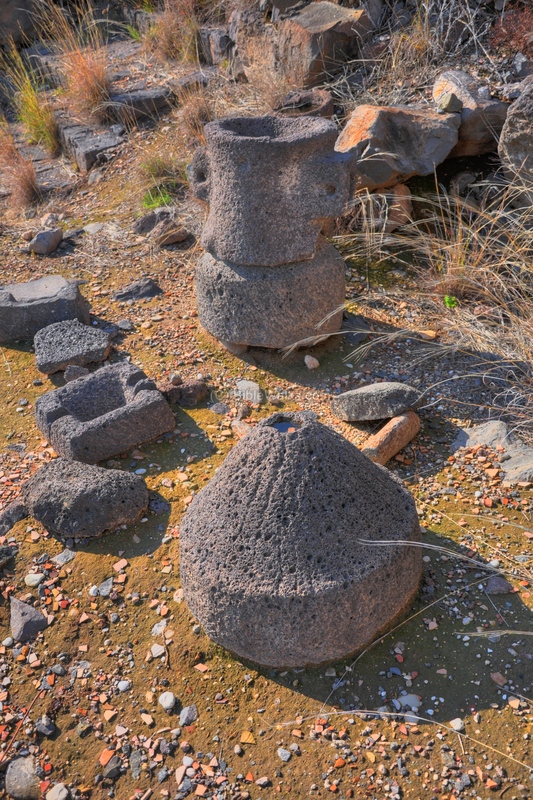 To the left of these millstones are fragments of another type of millstones - the "Olynthus" hand mill type. The process of grinding is different, where the upper millstone with the grooves is rubbed back and forth over the lower millstone, using a lever. Other stone basins are on display on the staircase below the mill. A large structure (11.0 x 5.5m) is located below the level of the flour mill and grand house. Its roof was supported by two arches. 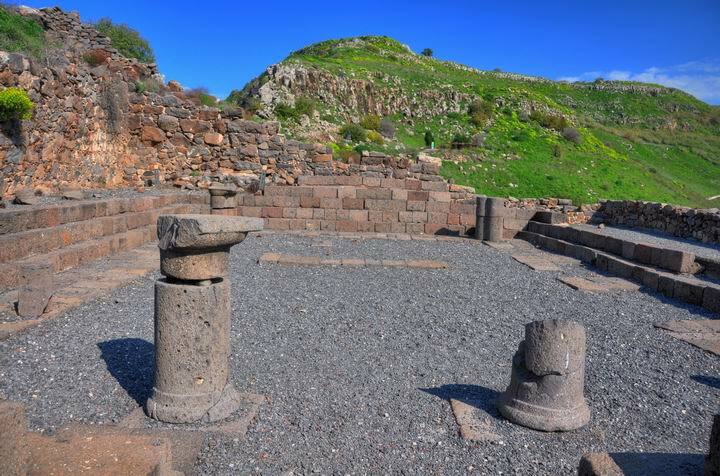 This structure is an oil press, dated to the 1st C AD, and is one of the most complete and large Roman oil presses found in Israel. 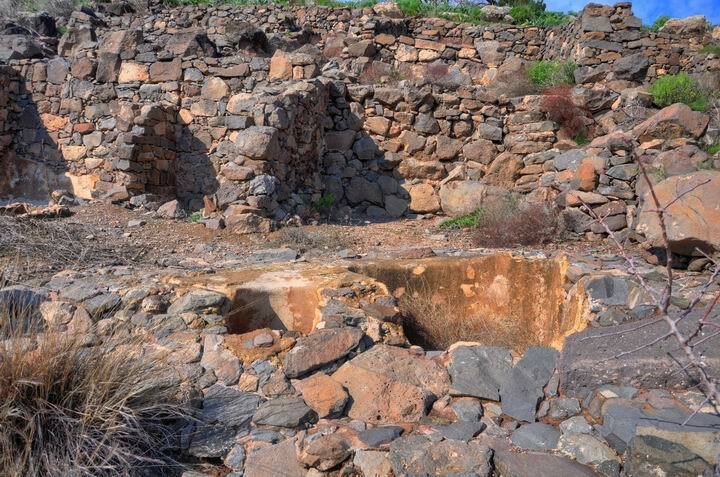 The following photo shows the oil press structure, and above it the flour mill and the large house which were presented above. 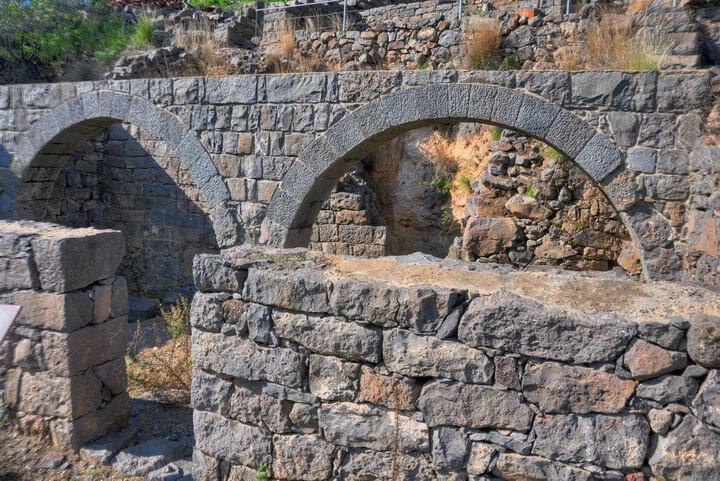 The double arches seen in the next photo held the roof of the oil press. 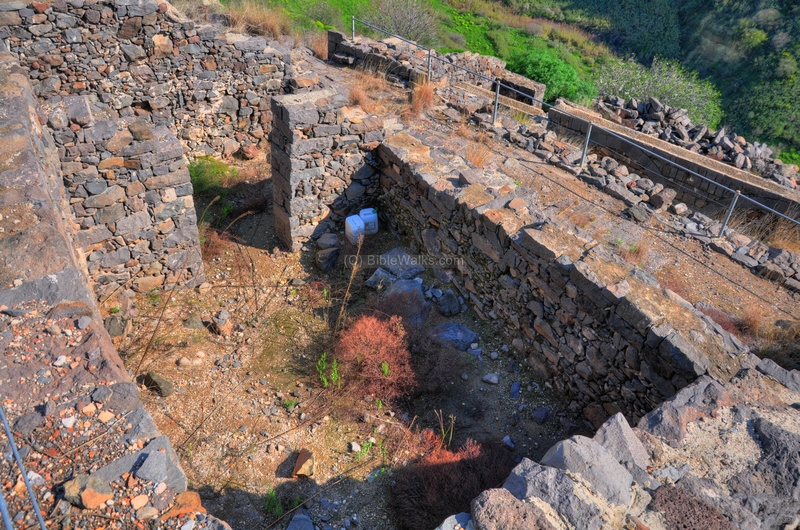 A view of the oil press house is also seen in the next photo from above. The oil press was divided to two sub-systems: under the left (eastern) arch is a large round crushing mill stone and its basin, while under the right (western) arch are two sets of oil presses. The oil production process involved both operations - first the olives were crushed in the left side, then they were pressed on both of the presses on the right side. A closer view of the crushing stone and basin is shown below. The stone rolled inside the basin, crushing the olives. The crushed olives would then be collected into a basket and moved to the oil press. This set is classified as crushing basin "3.1.1" (square hole) and crushing stone "3.8.2" (square hole + square groove). The crushing stone was turned around a vertical axis. The square hole with the groove inside the crushing stone was used to hook the stone to the vertical axis. A pair of oil press installations are located on the western side. Each press machine used force to press on the crushed olives contained in baskets in order to extract their juice. Each press machine was aligned along the south-west and north-west walls of the structure. The following photo shows the south press on the left side and the west press on the right side. A closer view of the south-west press is shown below. The floor around the press bed was plastered. The pair of pillars, which normally are on both sides of the press bed, are seen lining on the wall. The hole in the wall on the right was the anchorage point and axis of the wooden lever. The press bed (0.67m in diameter) and the cylinder collecting vat under it (type #4.2.3) are cut into the basalt stone, with a diameter of 0.7M and depth of 0.78m. 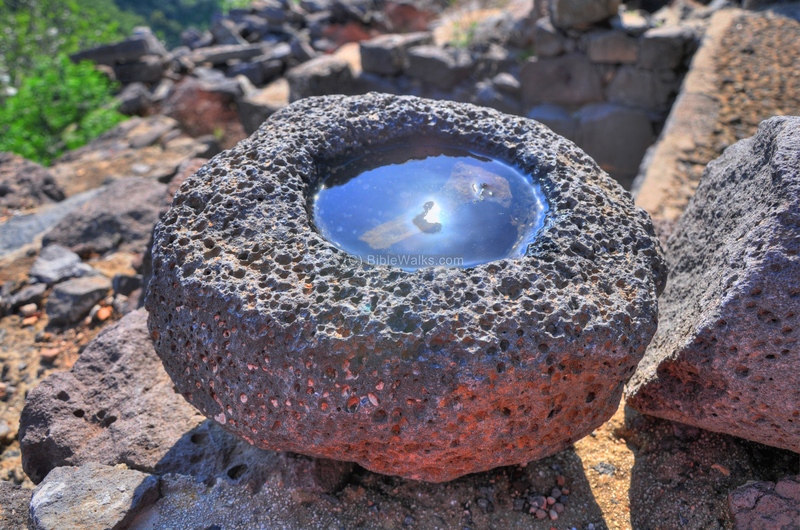 A ring of grooves are engraved into the basalt stone in order to drain the juice into the hole. 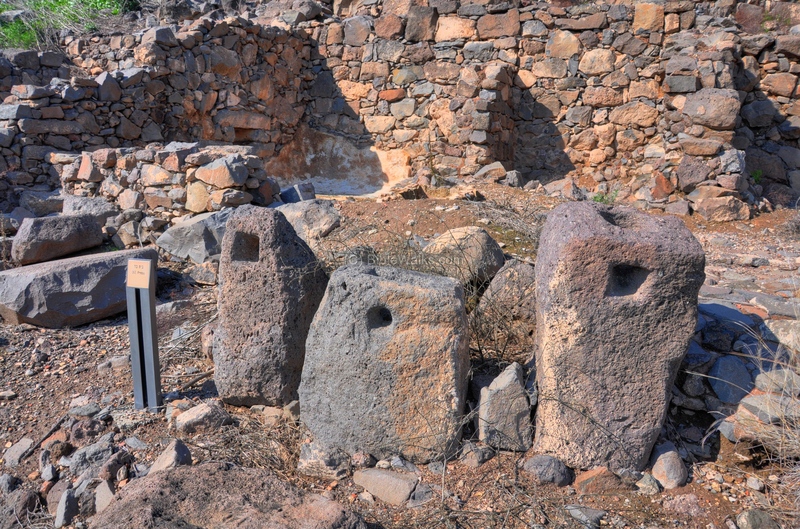 The stone weights (three of type "5.3.2") are seen in the next photo. The hole in the floor was where the weights were hanging over, while pushing down the wooden beam in order to force the lever down. 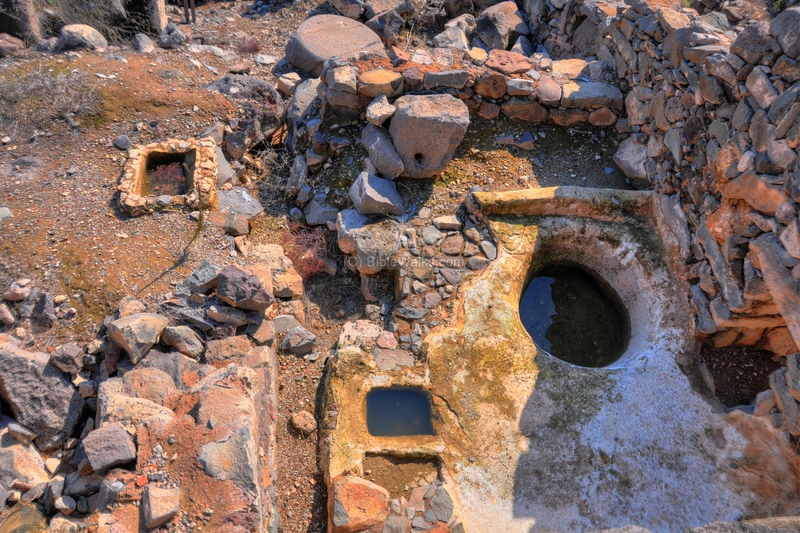 In the back side of the oil press room is a ritual bath - a Mikveh (or, baptismal) - which was required in order to produce the oil under strict Jewish religious practices. Several steps led down to the pool, where the worker would clean himself in order to purify himself before the sacred work of producing olive oil. Area S is the most western excavation and has additional residential houses and a public house. 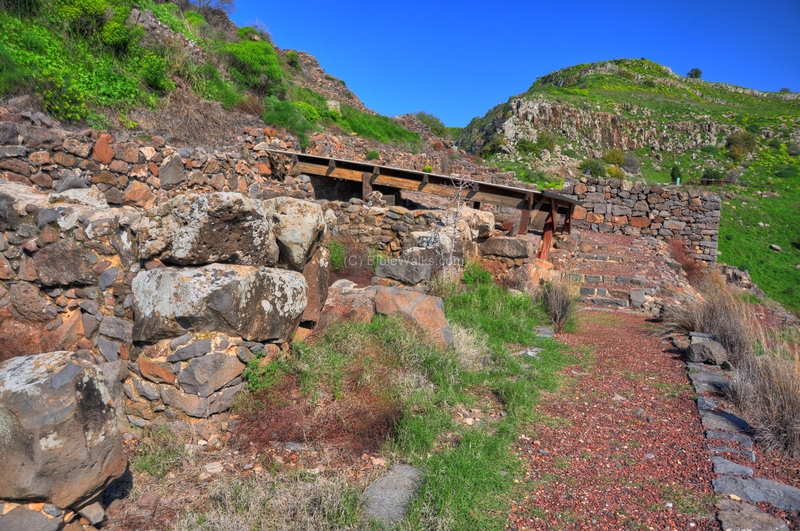 A rail structure is left over from the excavations of Areas R and S.
Additional houses were excavated in Area H, under the long trail that connected the western section to the eastern section. The valley seen in the background of this picture is the Daliyot stream. 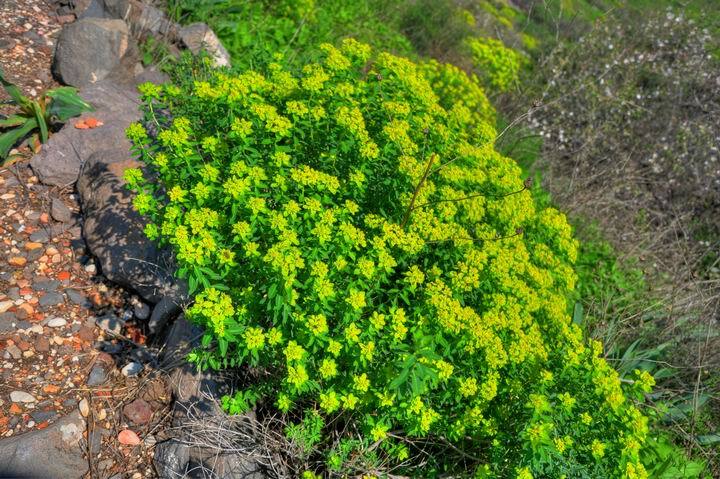 This shrub covers most of Gamla and flowers in the winter, painting the site in yellow-green. The type is called Jerusalem Spurge (Latin: "Euphorbia hierosolymitana", Hebrew: "Khalavluv Meguvshash"). Its resin is toxic. 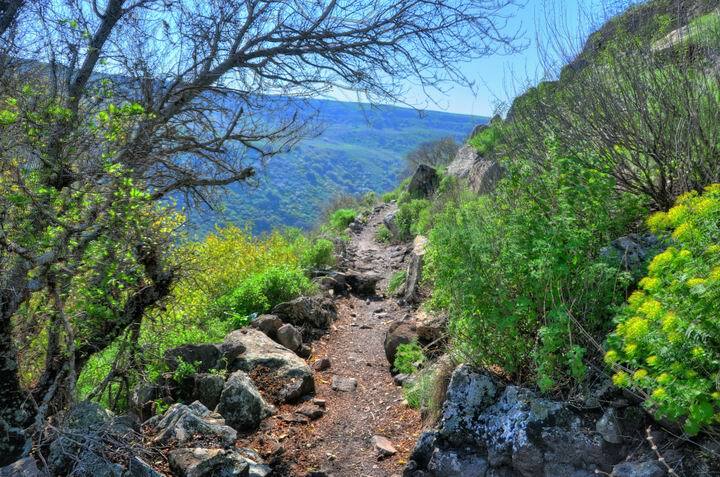 The steep ancient winding trail climbs up to the lookout point on the south side of the visitors center and parking lot. Along the way is a great view of Gamla. The Sea of Galilee is seen behind the hill in the distance. Along the trail are metal plates containing quotations from the accounts of Jospehus. When you are climbing up, breathlessly, its a good excuse to walk up slowly and catch your breath while pretending to read the signs. 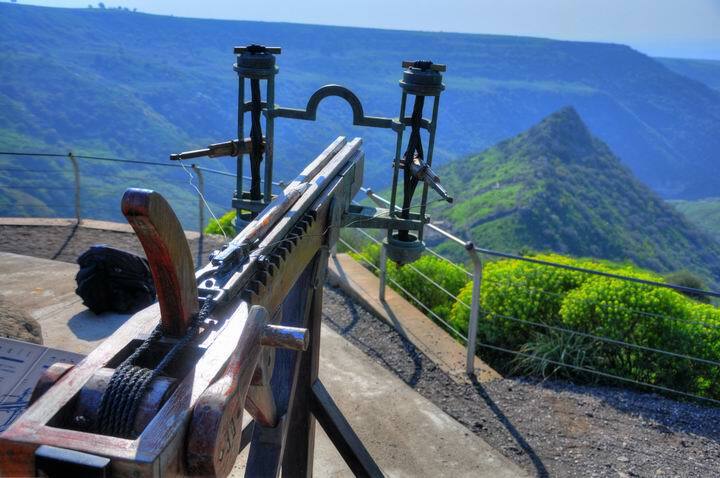 On the lookout point is model of a Roman war machine. The catapult was used to shoot arrows or bolts on human targets with great force and long range. Many such catapult arrows were found in the excavations. The mechanism was based on a pair of ropes that were twisted several times by two wooden arms. The arms were connected by strings to the rear of the arrow, which was laid in the slider and hold tight, secured by a safety latch. When the drawing mechanism was released, the tension of the ropes hurled the arrow to a long range. Gamla - based on the Hebrew word Gamal - a Camel - since it has a form of a single-hump camel. The camel was one of the main transportation vehicle in the Biblical times, and is referred many times in the Bible while describing property (the camel was an important asset) or travel. Their ability of carrying heavy cargo due to their strength, the ability to handle the dry conditions of the desert area with few stops for water - made them the best pack animals in the ancient times. A typical number of camels (50,000!) and relative ratio to other beasts (25 more times than asses) can be seen in a description of the battles of Reuben tribe against the Hagrites (1 Chronicles 5 21): "And they took away their cattle; of their camels fifty thousand, and of sheep two hundred and fifty thousand, and of asses two thousand, and of men an hundred thousand". 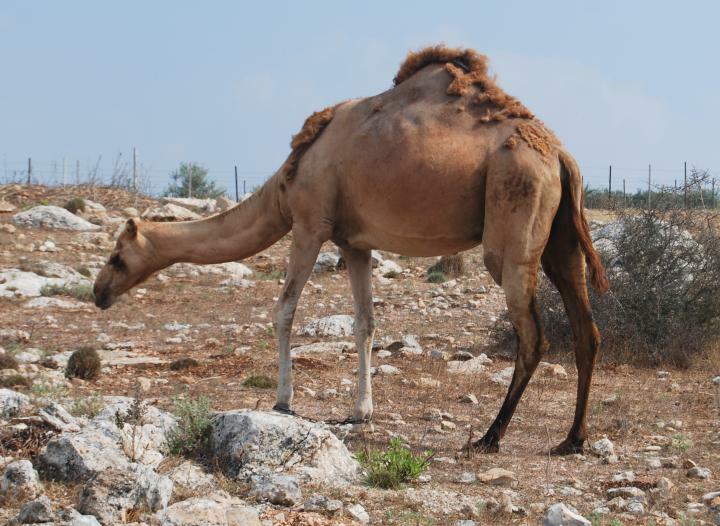 "Gamal" is retained with little variation in all languages: The Hebrew word was transformed in Greek to "Kamelos" and then it came to be "camel" in English as a shorter form. The Hebrew root word "Gamal" also means "pay back". This is based on the virtues of the camel - its advantages as a pack animal, and the benefits it provides - milk, meat, leather, hair.